© 2002, © 2019 by Paul Freeman. Revised 4/11/19. The 1956 USGS topo map (courtesy of Bruce Moore) depicted 3 short runways, labeled generically as “Landing Strips”. Not much is known about this little airfield, including its name or purpose. as it was not yet depicted on a 1946 aerial photo, the 1948 San Francisco Local Aeronautical Chart, or on the 1949 USGS topo map. The earliest depiction which has been located of this airfield was on the 1956 USGS topo map (courtesy of Bruce Moore). with the Hillcrest Detention Home to the south, and a “Relief Home” to the southeast. with a white “X” inside a circle on the northeast end of the longest runway. What may have been a hangar was located on the southwest side. 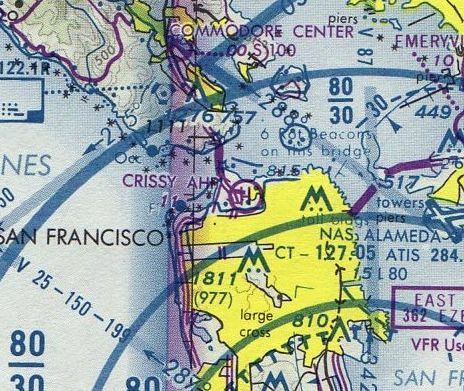 No airfield was depicted at this location on the April 1959 San Francisco Local Aeronautical Chart. 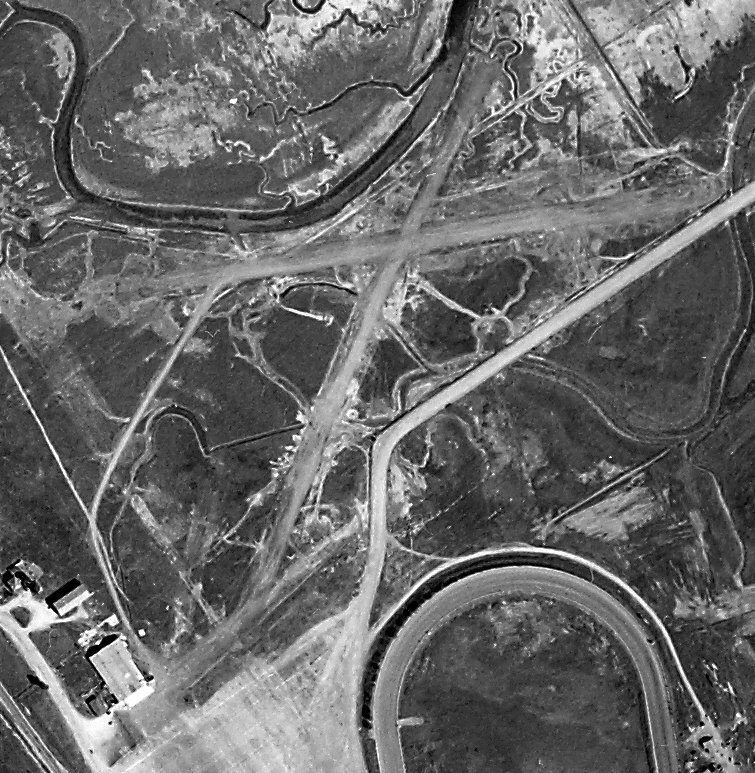 A 1968 aerial photo shows the runways had been removed, but traces were still recognizable. 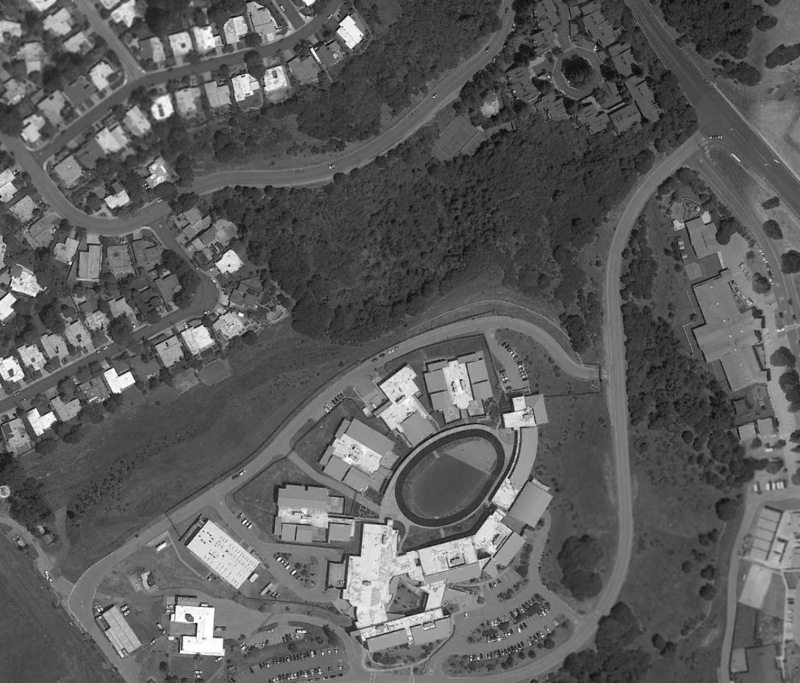 A 2018 aerial view shows the Hillcrest Juvenile Hall has been built over the site of the San Mateo Highlands Airfield. What may have original been a hangar still remains standing – the building at bottom-left, possibly reused by a fire station. The site of the San Mateo Highlands Airfield is located north of the western terminus of Tower Road. Thanks to Bruce Moore for pointing out this airfield. 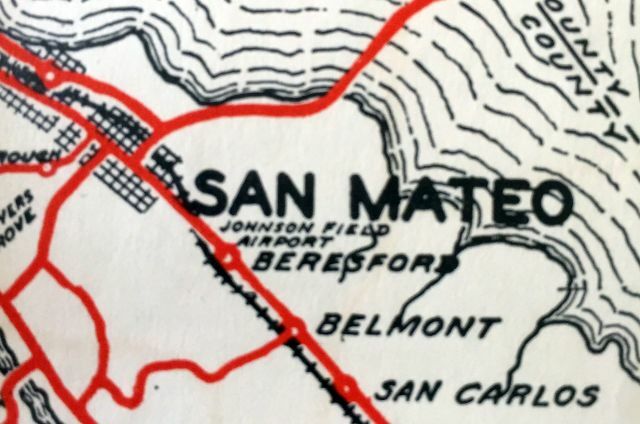 A 1932 map (courtesy of Kevin Walsh) depicted “Johnson Field Airport” to the southeast of San Mateo. The date of establishment of this small private airfield has not been determined. which labeled it as “Johnson Field Airport”. 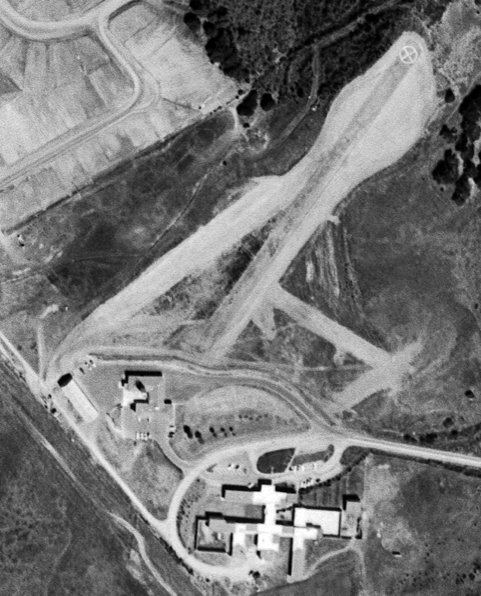 The earliest photo which has been located of Johnson Field Airport was on a 1946 aerial photo (from the UCSB Library, courtesy of Jonathan Westerling). It depicted the airfield as having a single unpaved northwest/southeast runway, with a small hangar & 8 small single-engine aircraft at the southeast corner. as that is how it was labeled on the 1947 USGS topo map. It depicted San Mateo Airport as a private field having a single northwest/southeast runway, with a slight bend in the middle. Three small buildings were depicted on the south side of the airfield. Note it also depicted Bay Meadows Airport across Bayshore Highway to the south. was on the 1948 San Francisco Local Aeronautical Chart (courtesy of Tim Zukas). It depicted San Mateo Airport as having a 2,200' unpaved runway. 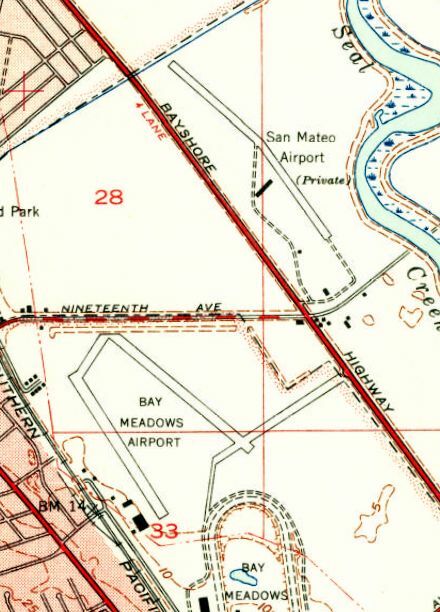 The 1948 USAF Urban Area Chart depicted San Mateo Airport as having a northwest/southeast runway & 2 taxiways. was on the 1949 San Francisco Local Aeronautical Chart (courtesy of Chris Kennedy). It depicted San Mateo Airport as having a 2,600' unpaved runway. 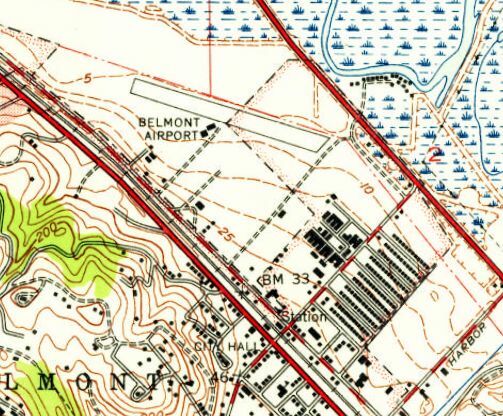 The 1949 USGS topo map depicted San Mateo Airport in the same fashion as the 1947 USGS topo map. 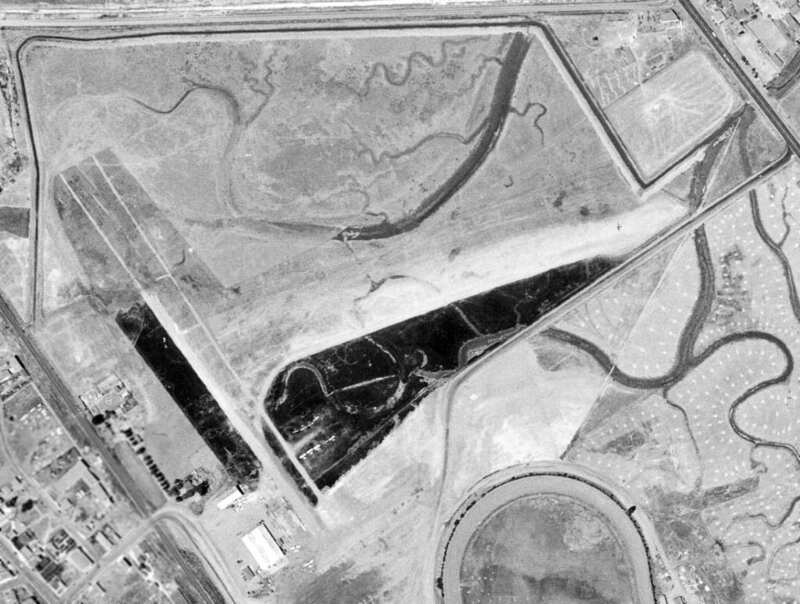 The last photo which has been located of San Mateo Airport was an undated aerial view looking north from the 1950 Air Photo Guide (courtesy of Kevin Walsh). and listed the manager as Edward Watson. 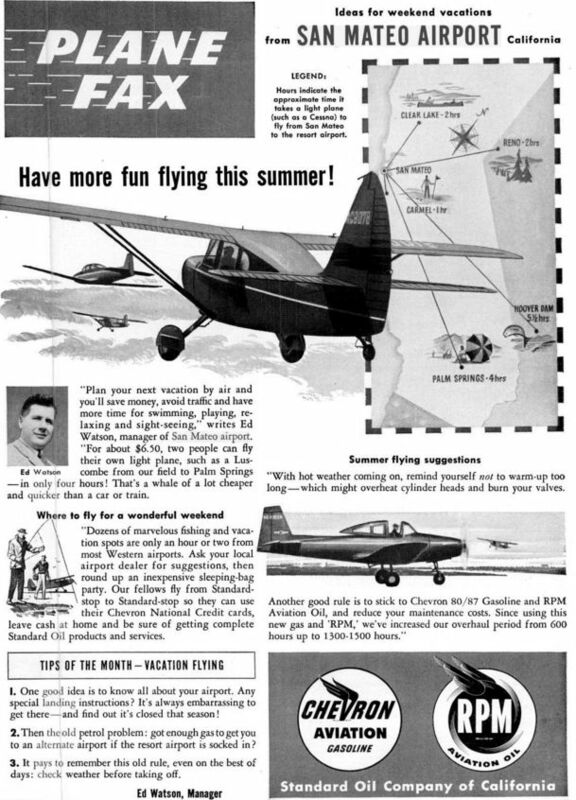 The last reference which has been located of San Mateo Airport was a June 1951 magazine advertisement for the airport (courtesy of Jonathan Westerling). A 2015 aerial view looking north shows no trace remaining of San Mateo Airport. The site of San Mateo Airport is located north of the intersection of the 101 Freeway & Route 92. Curtiss Wright Airport, as depicted on the 1933 San Francisco Airway Chart (courtesy of Chris Kennedy. 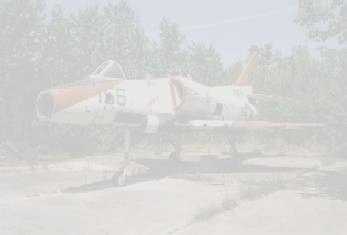 Photo of the airport has not been located. The date of establishment of the Curtiss Wright Airport in Belmont has not been determined. The earliest depiction which has been located of Curtiss Wright Airport was on the 1933 San Francisco Airway Map (courtesy of Chris Kennedy). It was evidently one of a large number of airports built & operated by the Curtiss Wright Company across the U.S. during that time period. 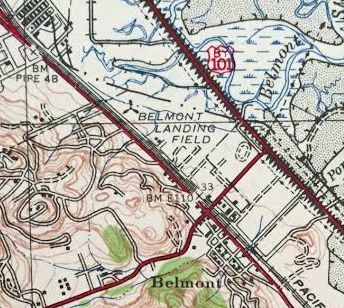 as the 1942 USGS topo map (courtesy of Kevin Walsh) labeled it as “Belmont Landing Field”. The earliest photo which is available of Belmont Airport is a 8/5/43 aerial view looking north from the 1945 AAF Airfield Directory (courtesy of Scott Murdock). It depicted Belmont Airport as an unpaved landing area. as a 114 acre irregularly-shaped property having 2 sod runways, measuring 3,200' east/west & 3,000' northwest/southeast. The field was said to have 2 wood & metal hangars, the largest being 100' x 50', and to be owned & operated by private interests. The last photo which is available of Belmont Airport was a 1946 aerial view (from the UCB Library, courtesy of Scott Murdock). with more than a dozen light single-engine aircraft parked near some small buildings on the south side. A typical healthy little airport in the post-WW2 general aviation boom. with 2 small buildings on the south side. It depicted Belmont Airport as having a 3,000' unpaved runway. 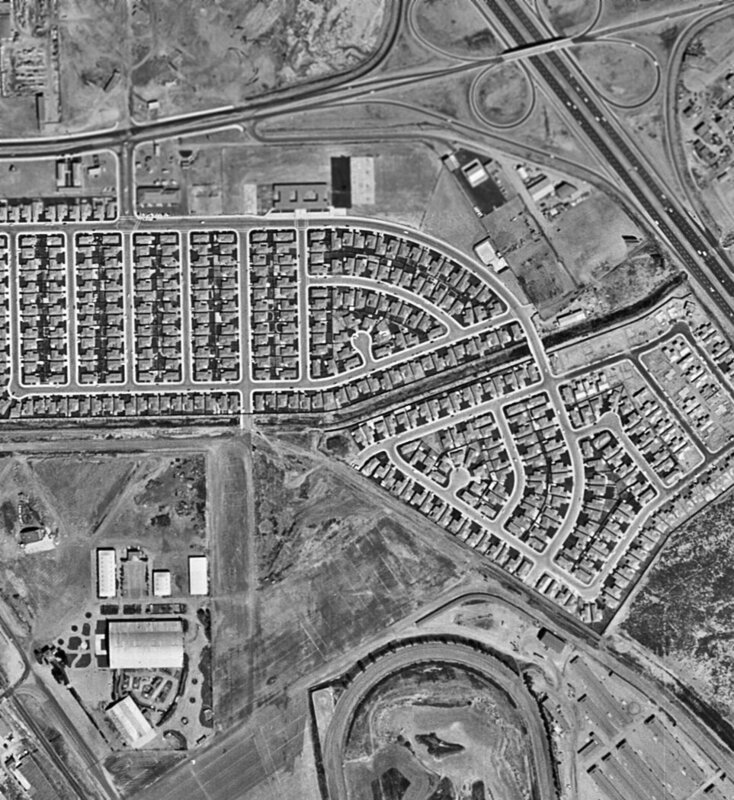 as a 1956 aerial photo showed new streets & dense houses covering the site of the little airport. A 2014 aerial view showed no trace of Belmont Airport. The site of Belmont Airport is located at the intersection of Marine View & Hiller Street. Thanks to George Harper for pointing out this airfield. showing a Hiller UH-12 operated by United Helicopters. and embraced many wartime innovations to make their lives more convenient. One of these innovations was the helicopter. Government reports & futuristic predictions held that the helicopter was poised to play a pivotal role in urban transportation. was in the 2/23/50 edition of the San Francisco Chamber of Commerce's “Bay Region Business”. 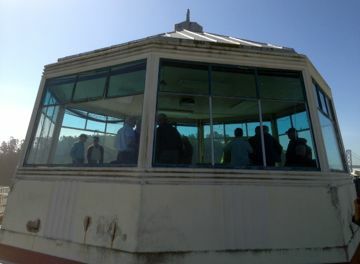 between the Chamber, the Board of State Harbor Commissioners & United Helicopters, Inc., of Palo Alto. 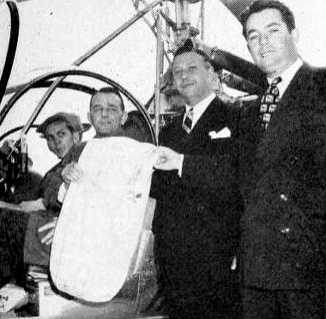 handing over the first airmail sack to leave from the San Francisco Heliport to helicopter pilot J. H. Demming of Hiller Helicopters. the first licensed public helicopter airport to be established in a metropolitan area west of New York City. and will immediately become a base for commercial & industrial rotary-wing activity in the heart of San Francisco." 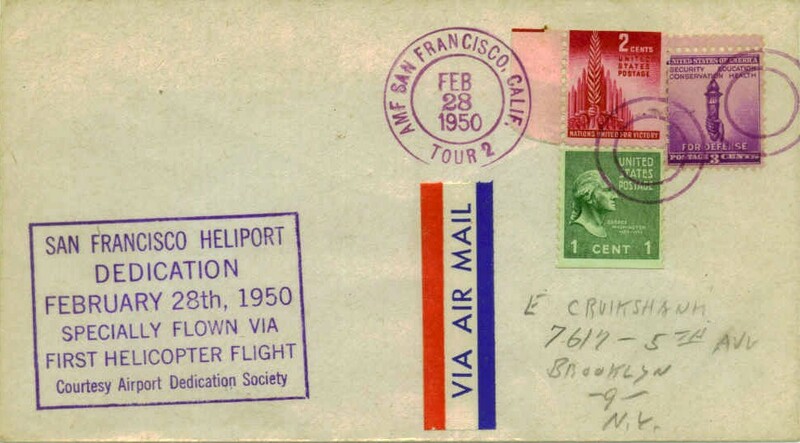 A postmark commemorated the 2/28/50 Dedication of the San Francisco Heliport. 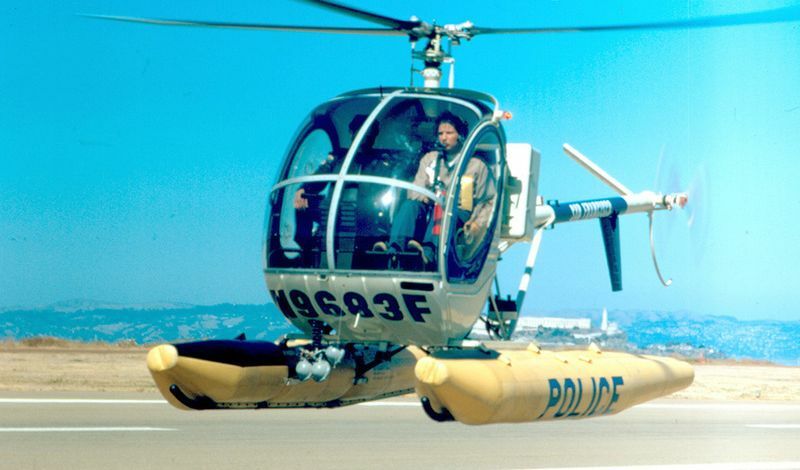 The caption under the photograph reads that she is “waving from the her campaign helicopter at the Ferry Building Heliport”. 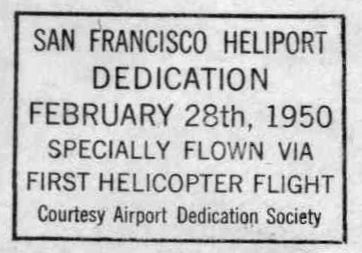 Jonathan Westerling reported, “Rick Helicopters Inc. had filed an application to provide service to & from San Francisco Heliport in 1952. The Civil Aviation Board took years, however, to act on the proposal which was finally approved in 1956. Rick Helicopters began began a taxi service between the new heliport & San Francisco international Airport in December that same year. Unfortunately a crash occurred offshore of the San Francisco Heliport just 3 weeks later. A famous opera singer, Mary Gray had just disembarked the helicopter and, along with dignitaries & reporters who had arrived to greet her witnessed the crash. 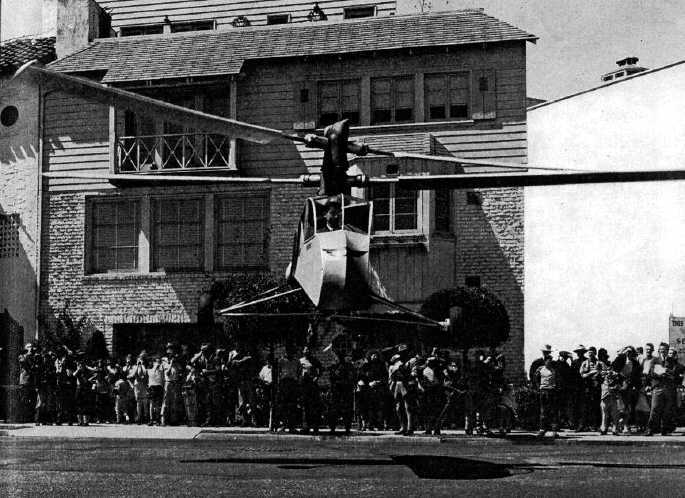 San Francisco & Oakland Helicopter Airlines became the first airline to operate an entirely turbine engine helicopter fleet. It was founded by former Los Angeles Airways vice president Mike Bagen in 1961. Passenger service started with 2 leased 10-passenger Sikorsky S-62 single-engine turbine helicopters operating 62 flights a day over their route network. Jonathan Westerling reported, “From the beginning, the helicopter service operated without any federal funds. This set it apart from the 4 other rotary-wing airport shuttle operations in other cities. 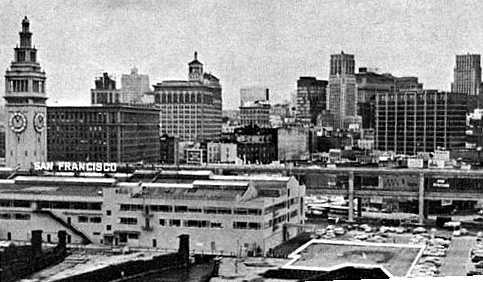 The first day of service from the downtown heliport was 6/1/61 according to the 1967 World Airline Survey. from the SFO Airlines 1962 timetable (from the collection of Björn Larsson, www.timetableimages.com). the trip from Downtown San Francisco to the San Francisco International Airport took just 8 minutes & cost $6.50. The helicopter fares from Downtown San Francisco to Oakland International Airport were subsidized by some airlines to increase business from that airport. The helicopter pilots even provided traffic reports to a local radio station while ferrying passengers. 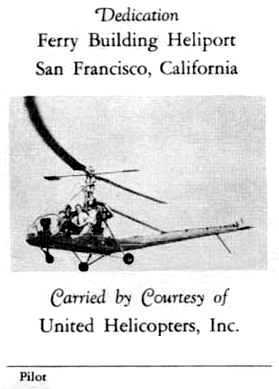 An undated (circa 1961-69) advertisement for SFO Helicopter Airlines, showing an SFO Sikorsky S-62 landing at the San Francisco Downtown Heliport. 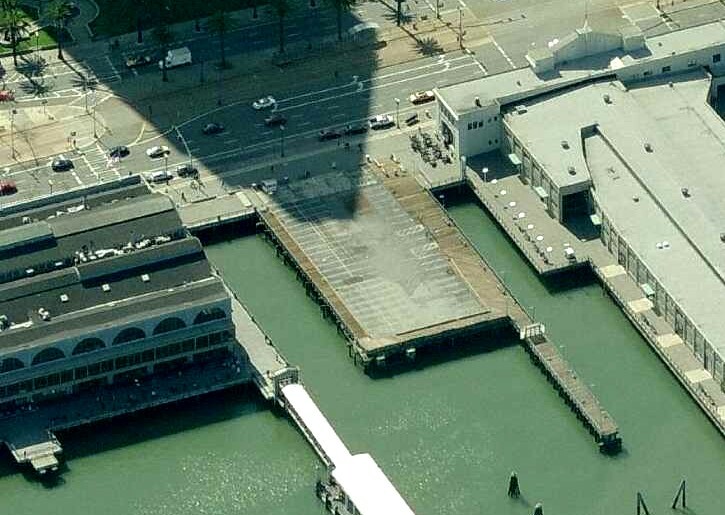 the airline announced it had to suspend service to the San Francisco heliport “due to deterioration of the pier” that the Heliport was on. 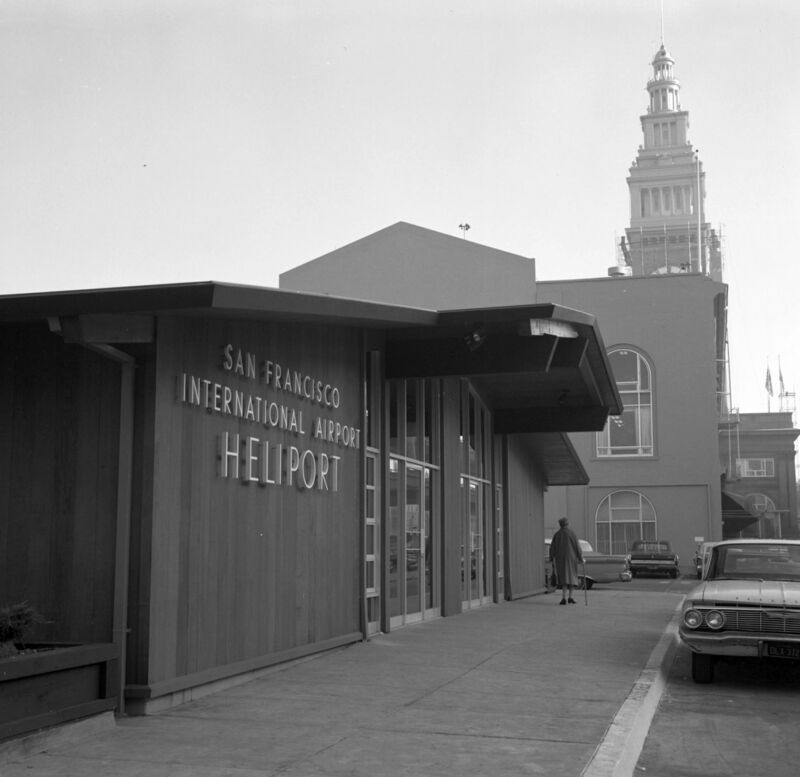 in August of 1965, SFO Helicopter Airlines was finally able to resume service to San Francisco Heliport. This time, however it used a novel approach: a pair of hovercraft. The equipment was a Westland SK-5. According to an article by Neil Harrison the 12/30/65 issue of Flight International, this was the first & only Air Cushion Vehicle scheduled service in America. The idea came from a 1964 visit to Oakland Airport by Sir Eric Mensforth, chairman of the Westland hovercraft company in the UK who provided the vehicles. Pilot training & certification began on 2/1/65 & a floating wooden ramp was constructed out into San Francisco Bay on which passengers would enter & exit. The slope of the ramp, depending on the tide, was about 1 to 10, and the sides were flared to assist in keeping the craft centered. and were equipped with both VOR & radar for operation in rain & fog. Operation was not permitted when the wind exceeded 25 knots or when a wave height in excess of 3 feet was forecast for the Bay. picking up passengers at the San Francisco Downtown Heliport (courtesy of Jonathan Westerling). the airline had to charge the same rates as helicopter flights. since laws restrict foreign-but water vessels from conducting intra-coastal trade in the US! 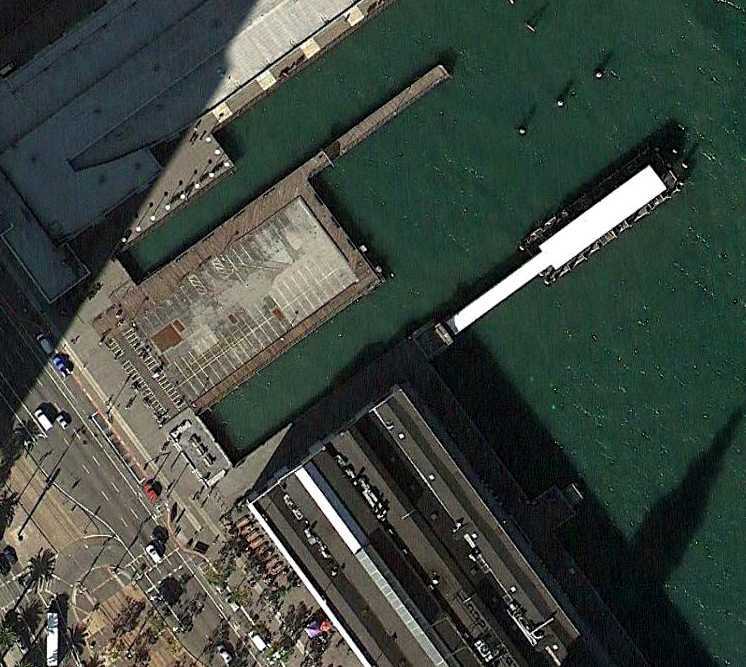 was funding a $9,000 study of the structural integrity of the piers under the San Francisco Heliport. When completed this allowed helicopter operations to resume at that location. Jonathan Westerling reported, “Accordingly service was restored in 1967 according to SFO Helicopter Airlines timetables. SFO Helicopter Airlines had added up to 3 leased 26-seat Sikorsky S-61N twin-engine helicopters to their fleet. 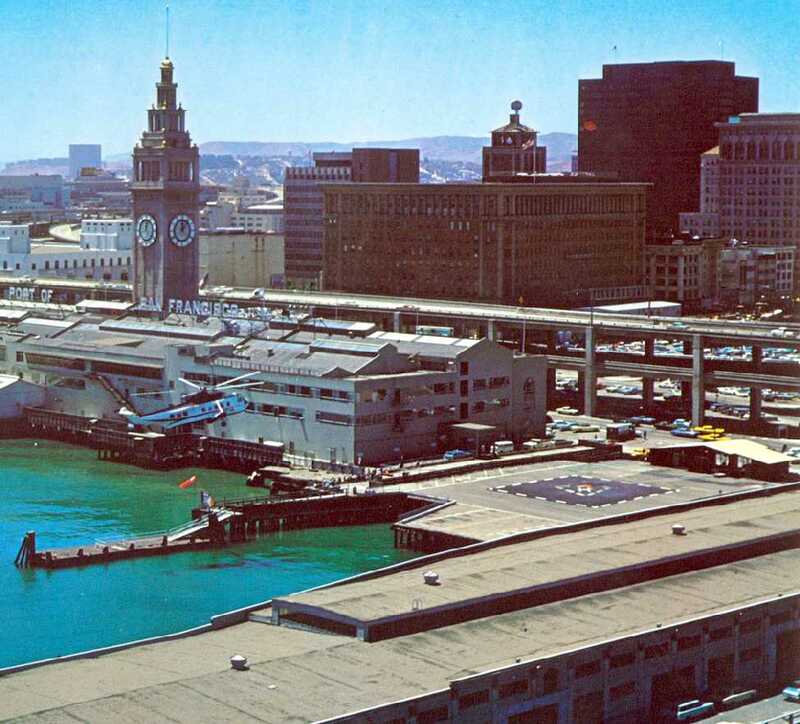 A 1968 photo of the entrance to the San Francisco Downtown Heliport terminal (courtesy of Kevin Walsh). landing at the San Francisco Downtown Heliport, with the Bay Bridge in the background. (© Robert W. Cameron, www.cameronbooks.com & www.cameronfolio.com, used with permission). 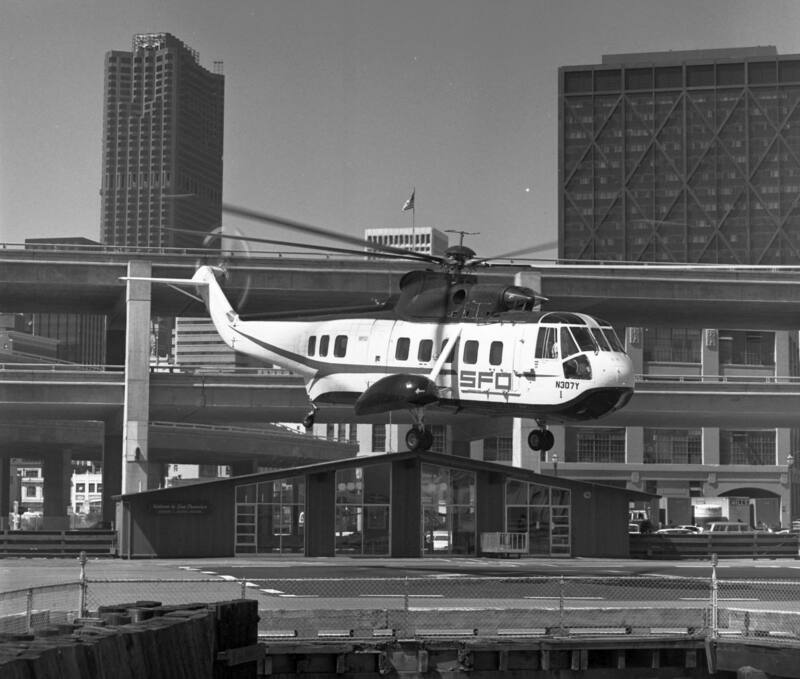 A 4/29/69 photo by Marshall Moxom of an SFO Airlines Sikorsky S-61 helicopter over the San Francisco Ferry Terminal Heliport (courtesy of the Collection of SFO Museum, via Jonathan Westerling). was on the 5/1/69 San Francisco Sectional Chart (courtesy of Bob Briggs). 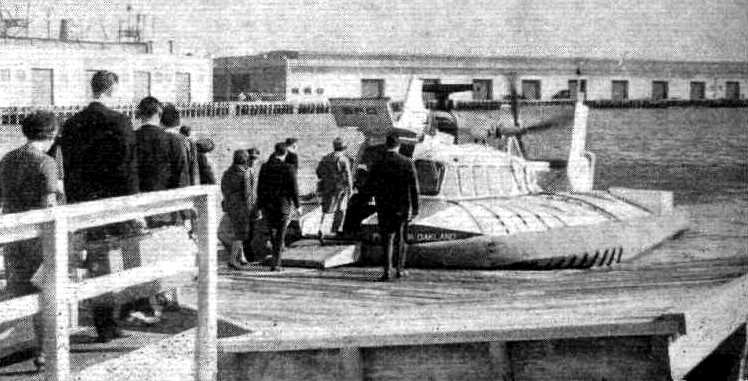 and two 15-seat SK-5 hovercraft at the height of its operations. and helicopter service to downtown was discontinued as well. 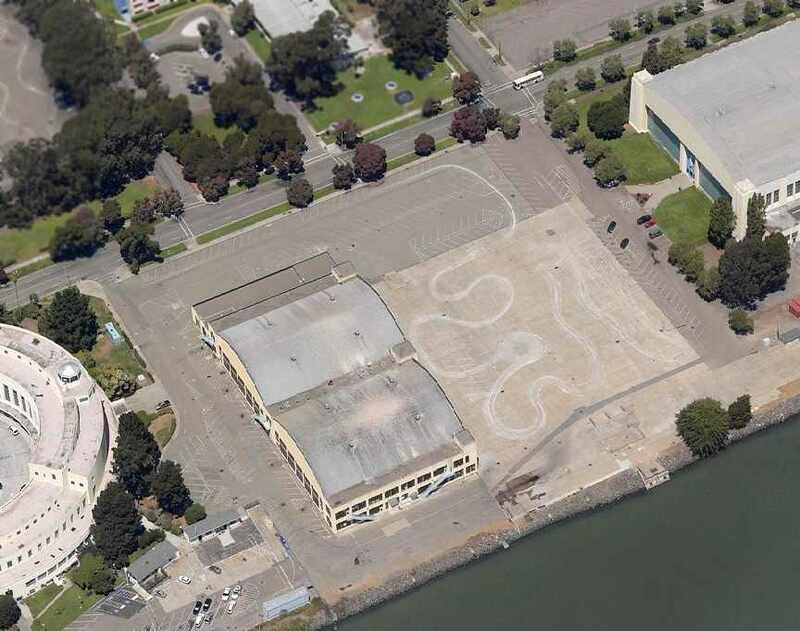 A 6/22/87 USGS aerial view no longer showed any heliport markings at the site of the San Francisco Downtown Heliport. The 1993 USGS topo map still depicted a Helipad. 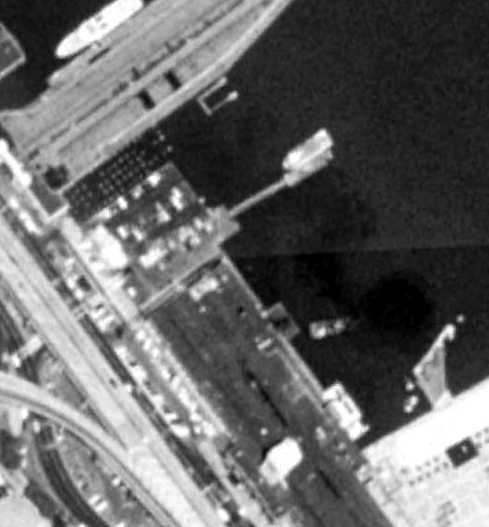 A circa 2005-2011 aerial view looking west showed the pier which previously held the heliport, but the heliport markings & passenger loading building was gone. 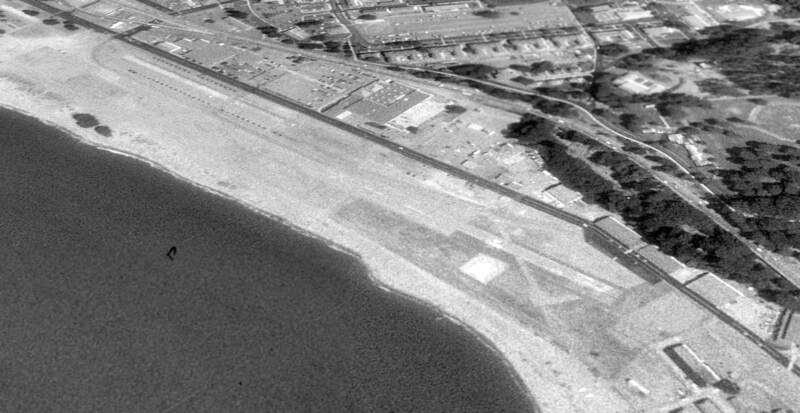 A 11/1/11 aerial view showed the pier which previously held the heliport, but the heliport markings & passenger loading building was gone. 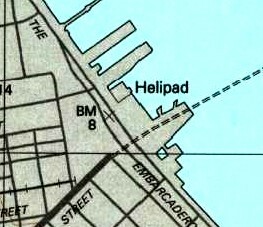 The site of the San Francisco Downtown Heliport is located east of the intersection of The Embarcadero & Washington Street. with Treasure Island & San Francisco Bay in the background. 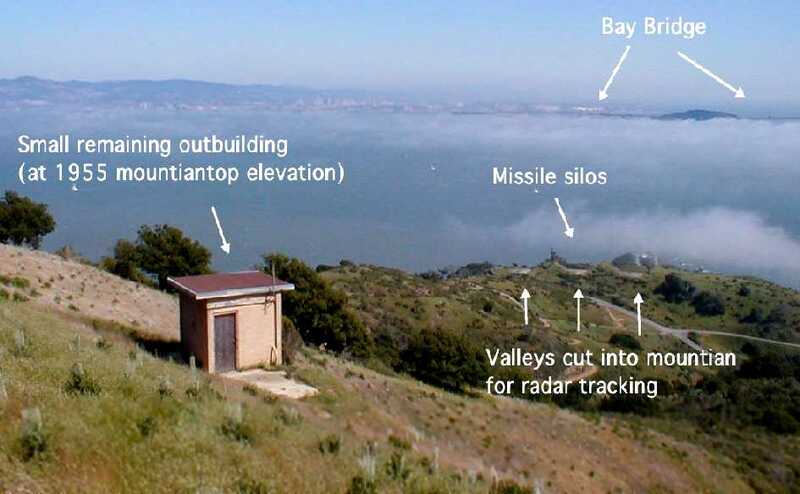 Jonathan Westerling reported, “From 1954 to 1962, Angel Island served as vital part of the US missile defense shield. 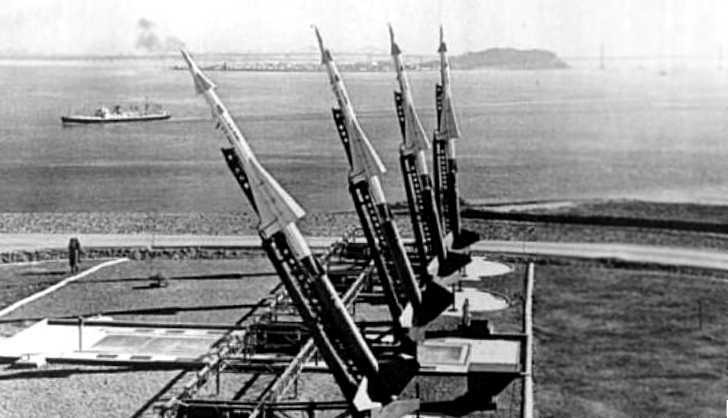 Perhaps the most astounding thing about this is that these missiles were set up in plain sight of, and a mere 3.5 miles away from downtown San Francisco! the San Francisco Defense Area was set up comprising of several radar & missile sites to defend against incoming enemy aircraft. and by the 51st Air Defense Artillery from then onward. SF-91C was the control station on top of the island & SF-91L was the launch pads on the southern shore. to construct a radar control complex & a helicopter-landing pad. 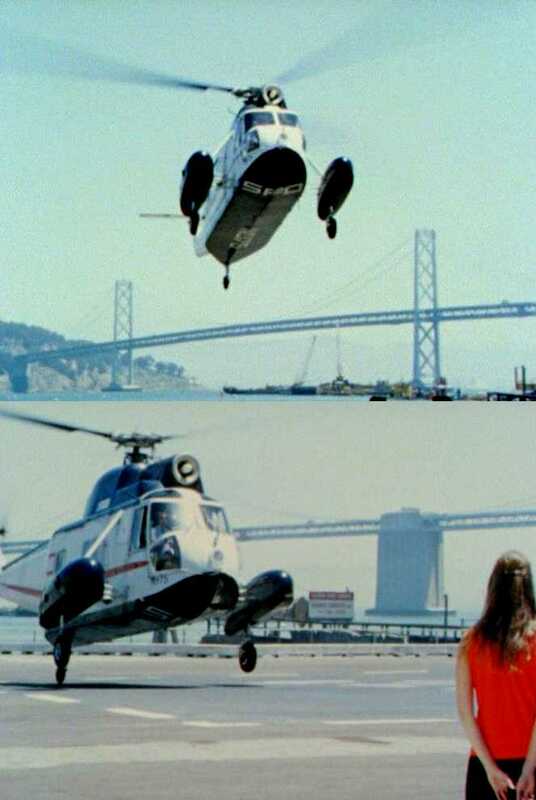 noted “the crash of a helicopter traveling between Crissy Field in San Francisco & Angel Island the previous day. 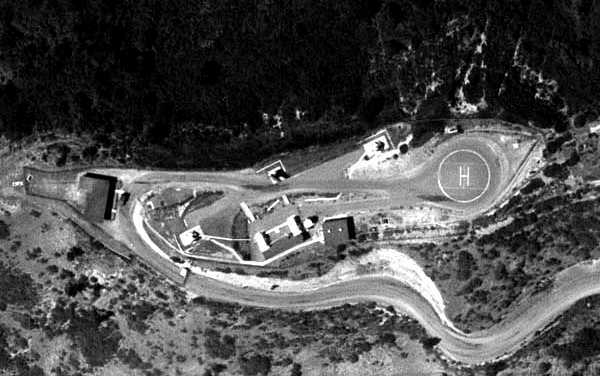 A 6/20/61 aerial view (courtesy of David Ruiz, Imagery Expert with Quantum Spatial Inc.) of the upper (control) heliport on the summit of Angel Island. 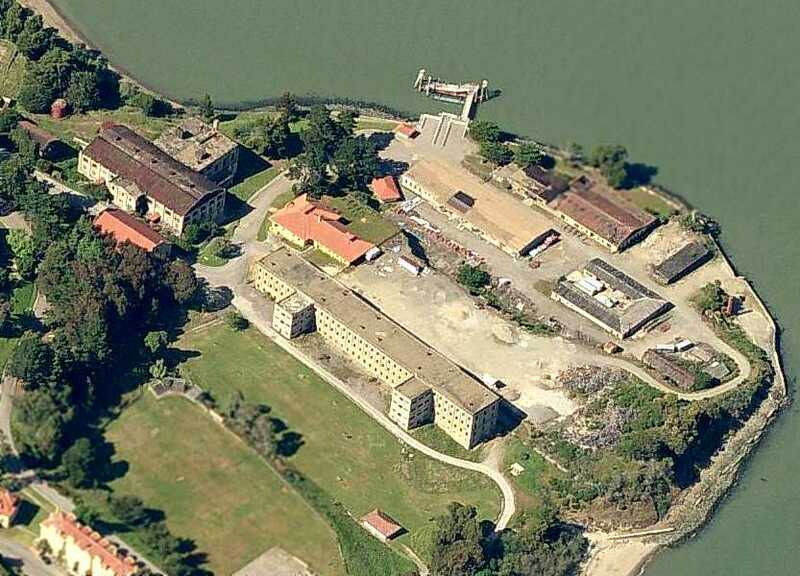 A 6/20/61 aerial view (courtesy of David Ruiz, Imagery Expert with with Quantum Spatial Inc.) of the lower (barracks) heliport on the east side of Angel Island. and across from the row of houses that the dependents lived. That would be the 1st Sergeant, some Chief Warrant Officers & other NCOs. although it’s easy enough to discern the former location of the TTR (Target Tracking Radar). Other than a small transformer building – the apparent remnant of the generator structure – and some foundations, everything else is gone. [The launch pads are] in great shape in & around the storage of 2 prefab buildings & a large woodpile. another magazine has 'Bee Section' lettering with appropriate artwork. near the Coast Guard station & a pier which the Army probably used for personnel & equipment transfer. 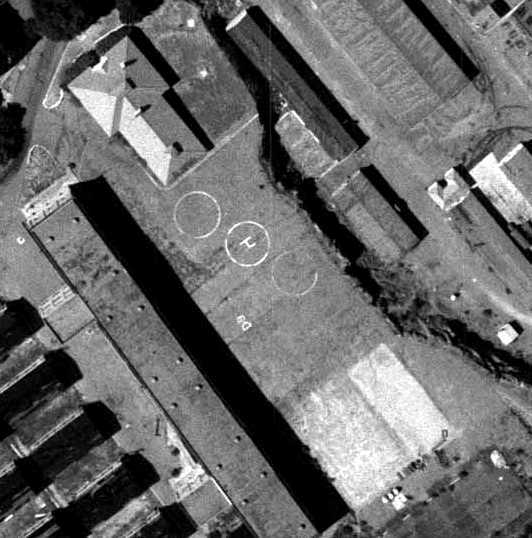 Overall, SF-91 is probably one of the best-preserved Nike sites in the San Francisco Defense Area. and overall the facility has great interpretive potential. A 2005 photo by Jonathan Westerling looking northeast “showing the top of Angel Island. This photo was taken soon after the 16' of earth were restored at the top of Angel Island. A 2005 photo by Jonathan Westerling looking southeast “showing the view from the control position down to the missile silos on Angel Island. The building shown is the only one remaining at the top of the island, but was fairly insignificant in terms of the Nike operation. The primary control buildings on top of the island were removed in the 1960s. 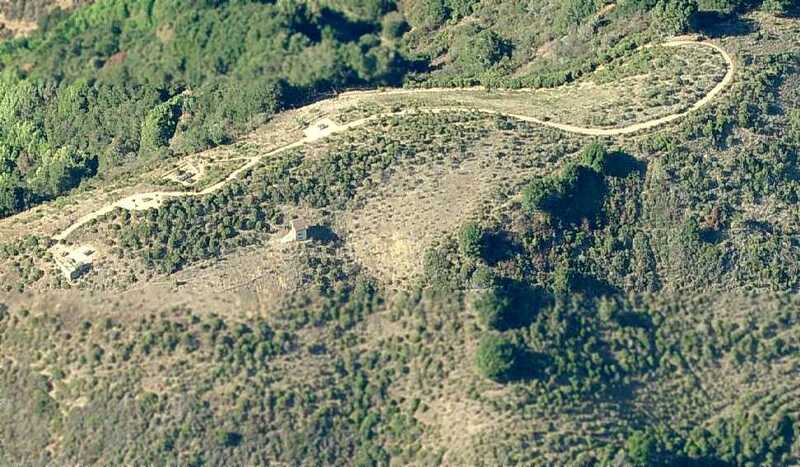 A circa 2007 aerial view looking north showing the location of the former helipad atop the summit of Angel Island. A circa 2007 aerial view looking north showing the location of the former helipad amidst the buildings on the east side of Angel Island. 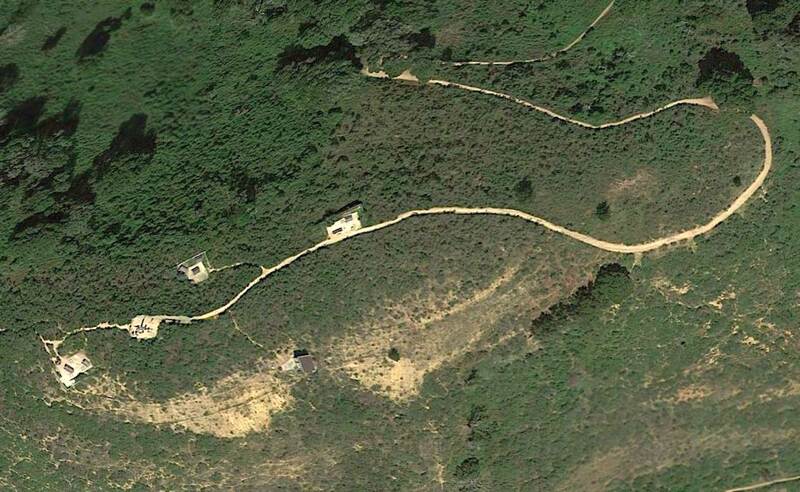 A 2016 aerial view of the site of the helipad atop the summit of Angel Island. A 1941 aerial view of Bay Meadows from the Alexandria Digital Library @ UC Santa Barbara (courtesy of Jonathan Westerling). This property may have had aeronautical roots going back to 1911. 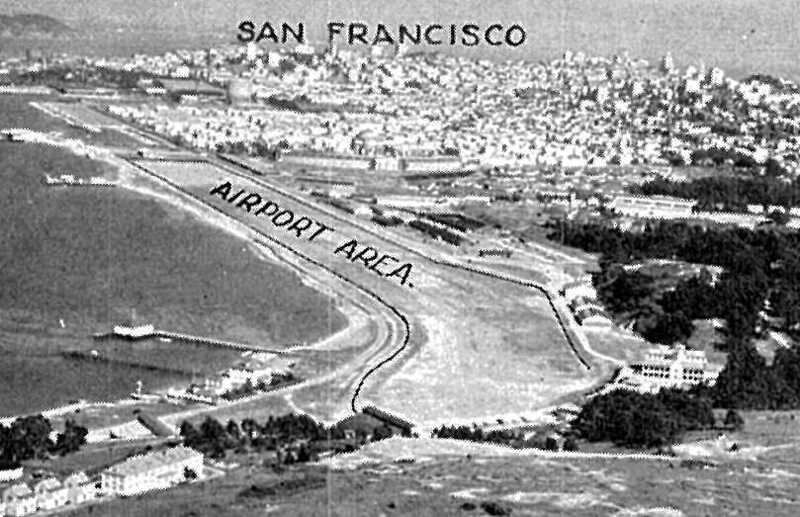 However, no airfield at this location was depicted on the 1933 San Francisco Airway Map (courtesy of Chris Kennedy). 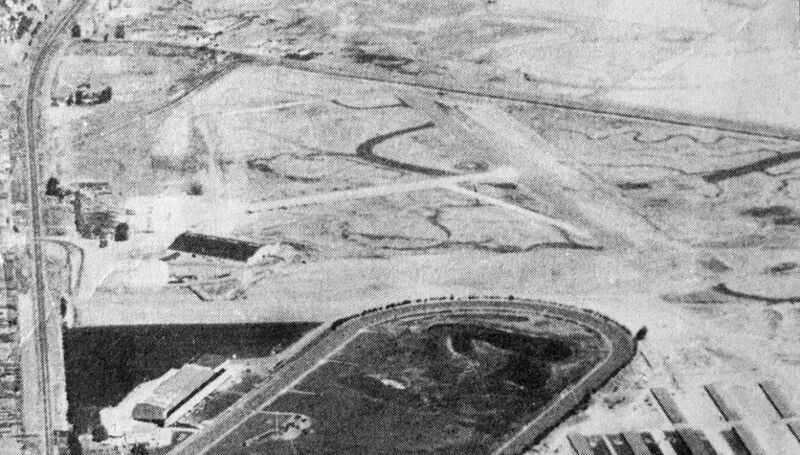 The Bay Meadows Race Track itself opened in 1934. The date of construction of the adjacent airfield has not been determined. The earliest depiction which has been located of Bay Meadows Airfield was a 1941 aerial view (from the Alexandria Digital Library @ UC Santa Barbara, courtesy of Jonathan Westerling). It depicted the field as having 2 unpaved runways in an “X” shape, with a hangar to the southwest. showed that the runways had been completely removed, perhaps due to wartime security concerns along the west coast. The hangar remained, but the site was no longer recognizable as an airfield. 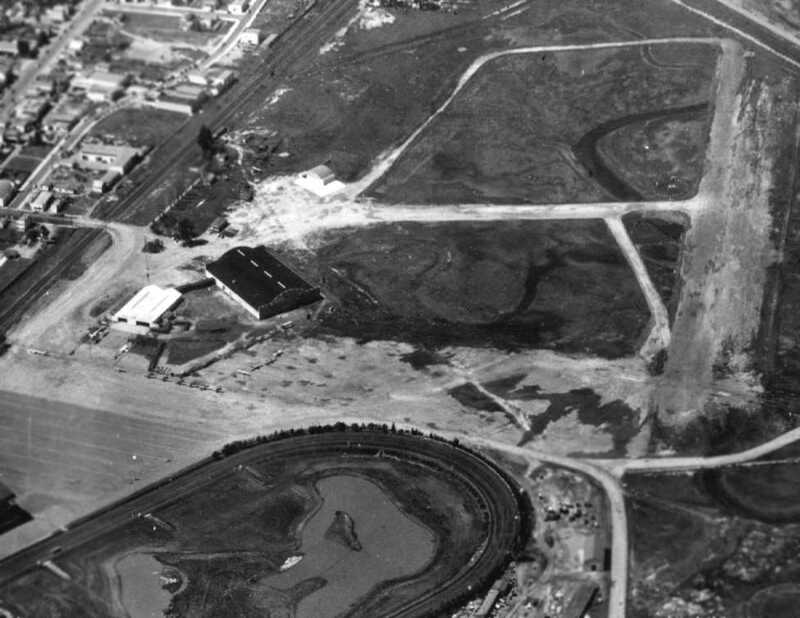 The Bay Meadows runways were evidently reconstructed at some point between 1943-45. A history of the race track mentions that "the first horse transported by air landed at Bay Meadows. country & western entertainer Stuart Hamblem, to contest the Burlingame Handicap. After landing safely on an airstrip adjacent to Bay Meadows, El Lobo completed the history-making journey by winning the race." from the cover of a July 1945 brochure (courtesy of Aaron Becker). with a total of 16 (!) hangars lining ramps on the north & south sides of the runways. This extensive layout of hangars was apparently a somewhat grandiose plan, which was never completely realized. The airport engineer was listed as Frederick Dupuy, and the field's architects were listed as Douglas Stone & Lou Mulloy. as the departure point of a 1946 flight which ended in a fatal crash. A 7/29/46 aerial view of the Bay Meadows Airport depicted the field as having 2 unpaved runways, with 2 hangars on the southwest side of the field. parked around a hangar on the southwest side of the Bay Meadows Airport. 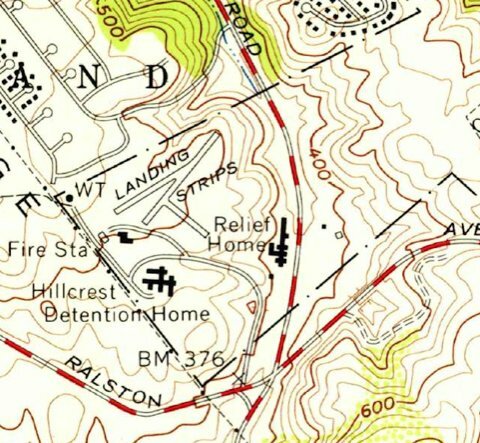 The earliest map depiction which has been located of Bay Meadows Airport was on the 1947 USGS topo map. 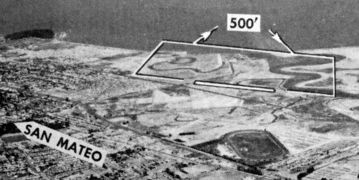 It depicted Bay Meadows Airport as having a total of three 2,300' runways or taxiways adjacent to the northwest side of the race track. Two buildings or hangars were depicted on the southwest side of the airfield. 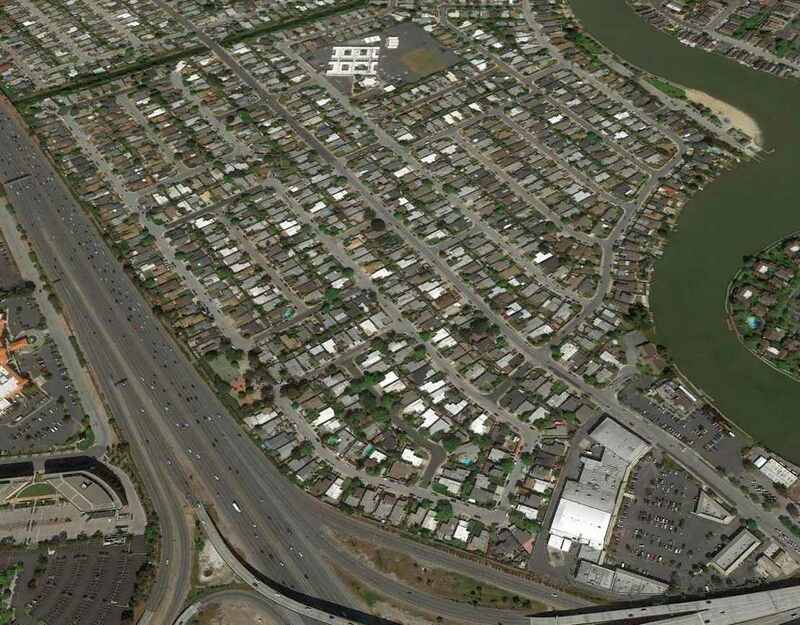 Note it also depicted San Mateo Airport across Bayshore Highway to the north. 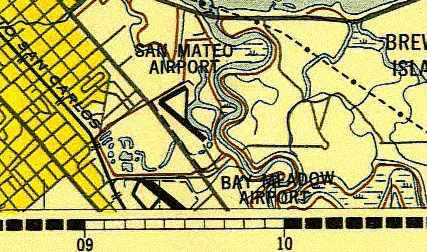 The 1948 USAF Urban Area Chart depicted Bay Meadows Airport as having a northwest/southeast runway. depicted Bay Meadows Airport as having a 2,400' paved runway. with 2 hangars on the southwest side of the field, around which were parked a dozen light aircraft. The racetrack was visible in the foreground. An undated (circa 1940s?) aerial view looking north at Bay Meadows Airport (courtesy of Kevin Walsh), with the racetrack visible in the foreground. depicted "Bay Meadow" Airport as having a 2,700' unpaved runway. 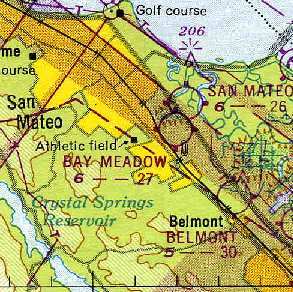 The 1949 USGS topo map depicted "Bay Meadows Airport"
as having a total of three 2,300' runways or taxiways adjacent to the northwest side of the race track. 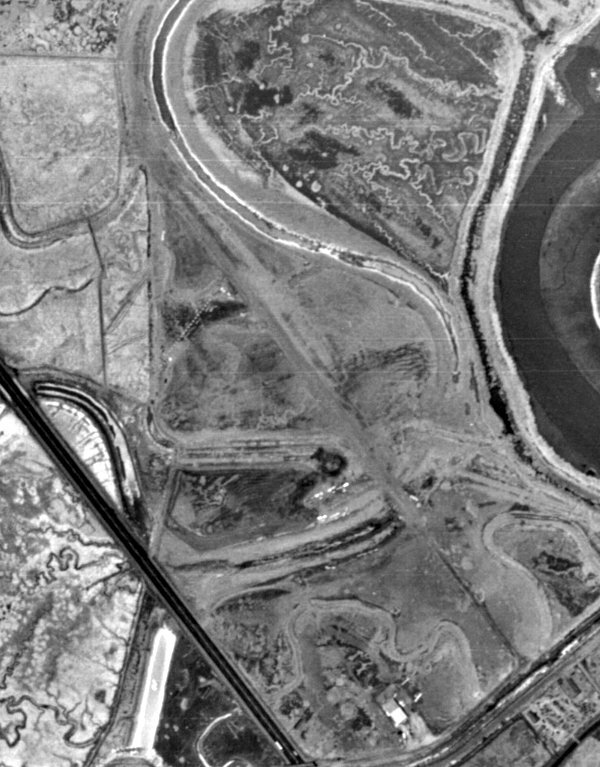 The last photo which has been located showing Bay Meadows Airport was an undated aerial view looking north from the 1950 Air Photo Guide (courtesy of Kevin Walsh). It described Bay Meadowns as having a 2,750' oil surface Runway 13/31. The field was said to feature a hangar, and the manager was listed as Robert Gunderson. 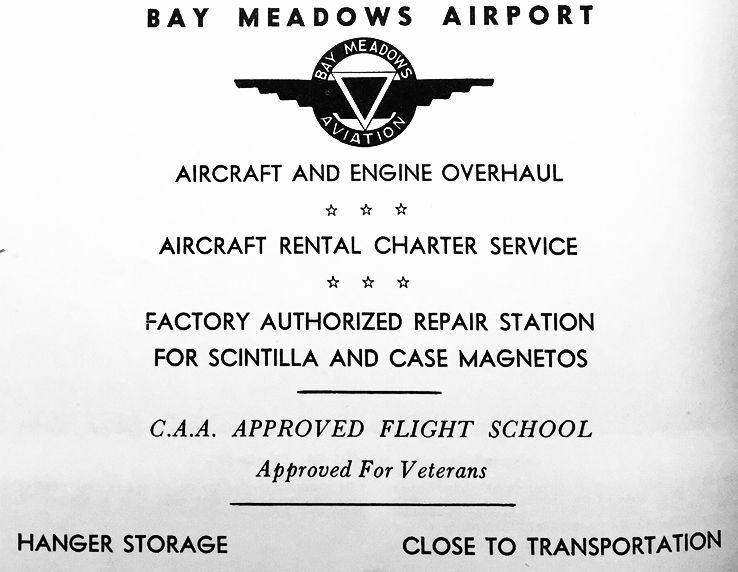 An advertisement for Bay Meadows Airport from the 1950 Air Photo Guide (courtesy of Kevin Walsh). Jim Douglass recalled, “I lived about 3/4 of a mile from the Bay Meadows airport from 1958-72. My father had kept a Cessna 140 there until it closed sometime around 1954. According to him, the field had been privately owned. but to expand the facilities to where it would support scheduled DC-3 service. This was, of course, in the days of regulated air carriers & 'feeder' lines which landed every 30 or 40 miles. Jim continued, “When we lived there, the property housed the county fairgrounds. and at least 4 (maybe as many as 6) large hangars still existed & were used as display halls. 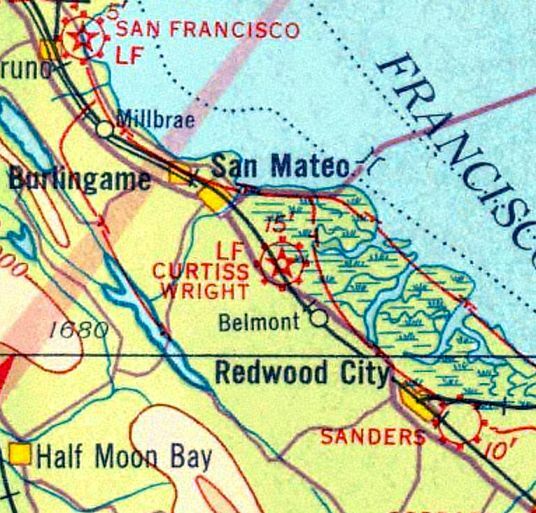 by the time of the 1955 San Francisco Sectional Chart (according to Chris Kennedy). 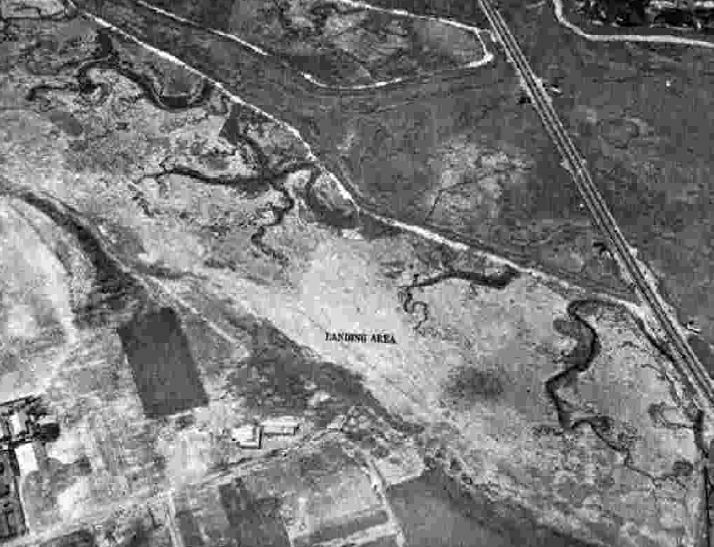 A 1956 aerial view (from the UCSB Library, courtesy of Jonathan Westerling) showed that houses had been built over the northern portion of the former airport. The smaller hangar had been removed at some point between 1946-56, but the larger hangar remained standing. as being the location of the Fiesta Gardens School & the Fiesta Grounds (County Fairgrounds). but a former hangar remained standing on the southwest portion. 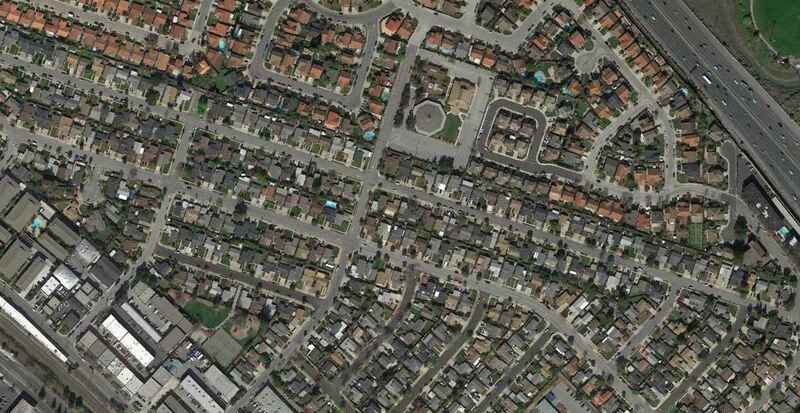 which occupies the northeast corner of the site of the Bay Meadows Airfield. 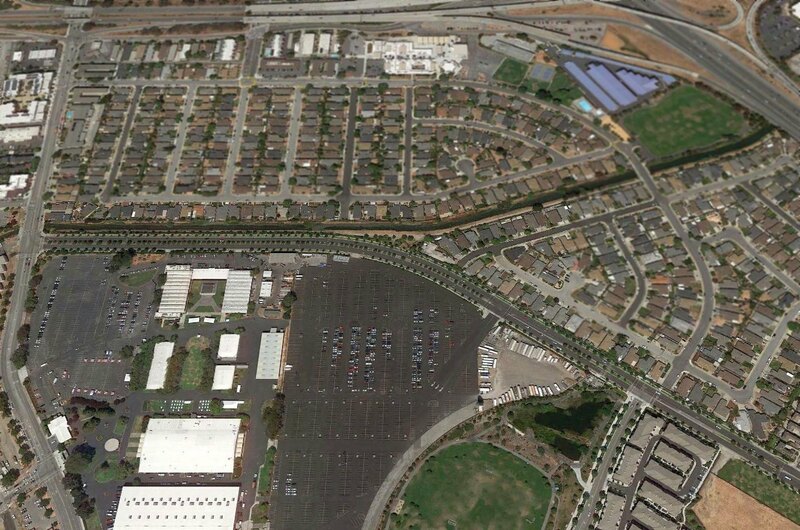 some small factory/warehouse type buildings, and a San Mateo - Foster City School District center." 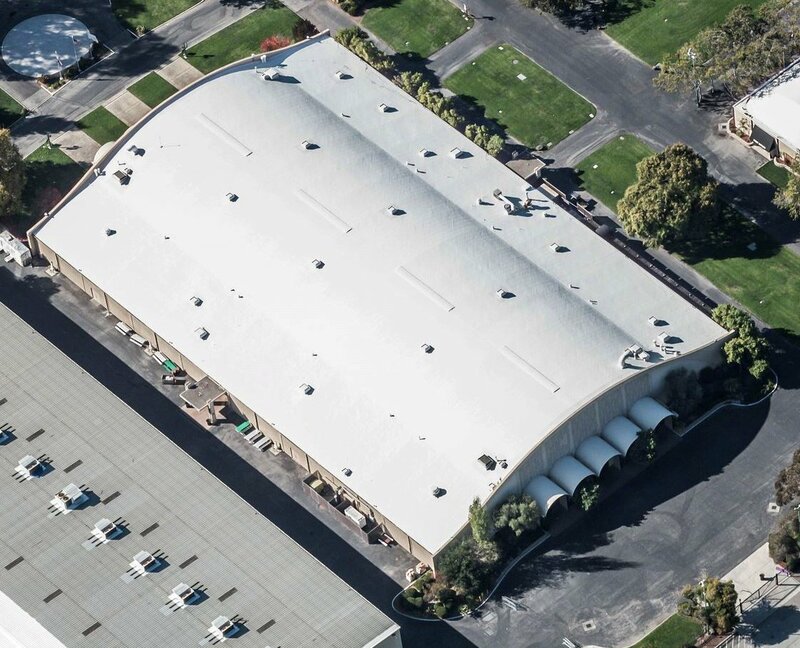 A circa 2012-2018 aerial view looking north at the former Bay Meadows Airport hangar. A 2018 aerial view looking north at the site of Bay Meadows Airport, showing the former hangar which remains standing on the southwest part of the property. As of 2018, street maps label the former Bay Meadows Airport hangar as Fiesta Hall. The site of Bay Meadows Airport is located southwest of the intersection of the 101 Freeway & Route 92. A 3/30/32 rendering looking east at the proposed Golden Gate Union Air Terminal on the north end of Treasure Island (courtesy of Tim Tyler). 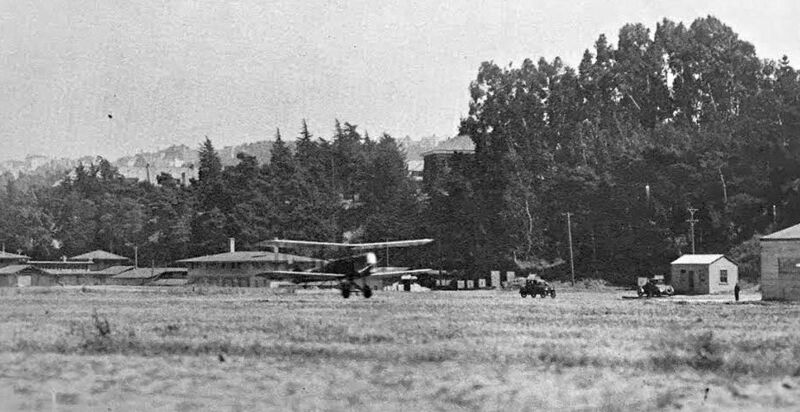 operated simultaneously with Mills Field (now San Francisco International Airport. with 2 intersecting runways & a row of hangars on the southern side of the airfield. as an economic, political & cultural force in the increasingly important Pacific region. This would eventually become the 1939-1940 Golden Gate International Exposition. The site would also become San Francisco's new municipal airport following the Exposition. 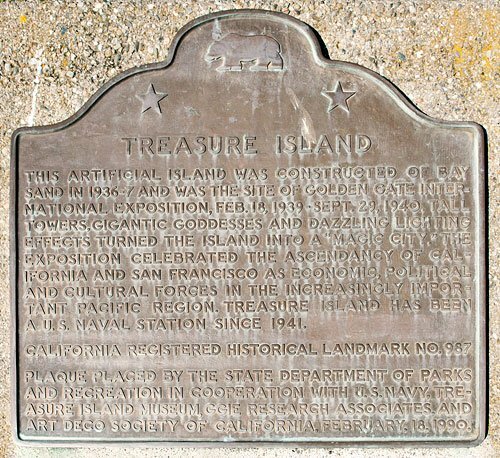 The construction of Treasure Island began in 1936. An undated (circa 1930s?) artist's conception looking northeast at the planned Treasure Island Airport. 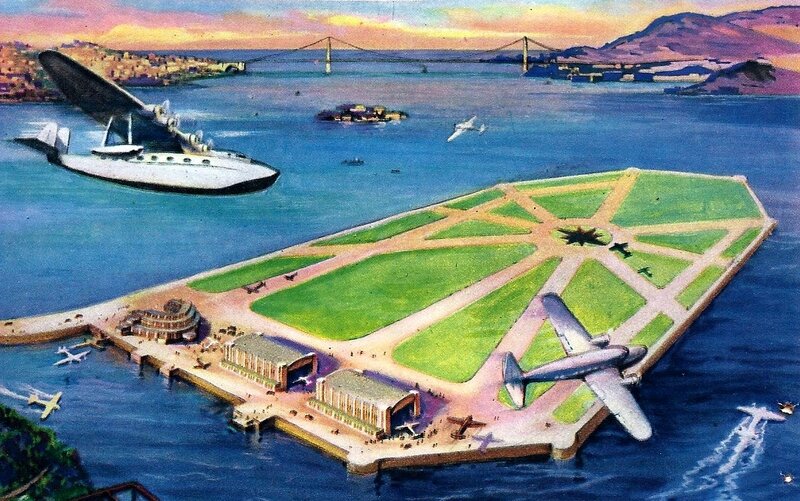 A painting by Ken Sawyer from a November 1938 magazine article looking northwest at the planned Treasure Island Airport (courtesy of Anne Schnoebelen). along with a never-built series of 9 runways emanating from a central point on the north end of the island. 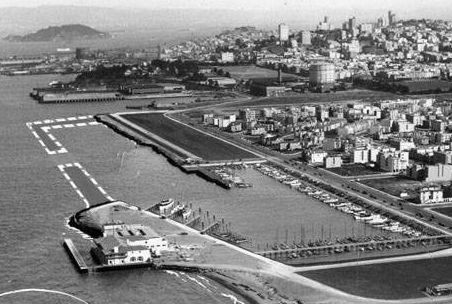 The earliest photo which has been located of Treasure Island was a circa 1938 aerial view looking west (courtesy of Kevin Walsh). and other Golden Gate Exposition buildings under construction. A 1938 street map (courtesy of Kevin Walsh) depicted the “Golden Gate International Exposition Site (1939)”. The construction of Treasure Island was completed in 1939.
were transported to or dredged from the Bay & the Sacramento River delta. from which fill was dredged to create the island. Approximately 259 thousand tons of rock were used to create a rock wall to contain the island. Buildings & structures for the Golden Gate International Exposition were going up even before the Bay fill dried. The exposition opened in 1939. 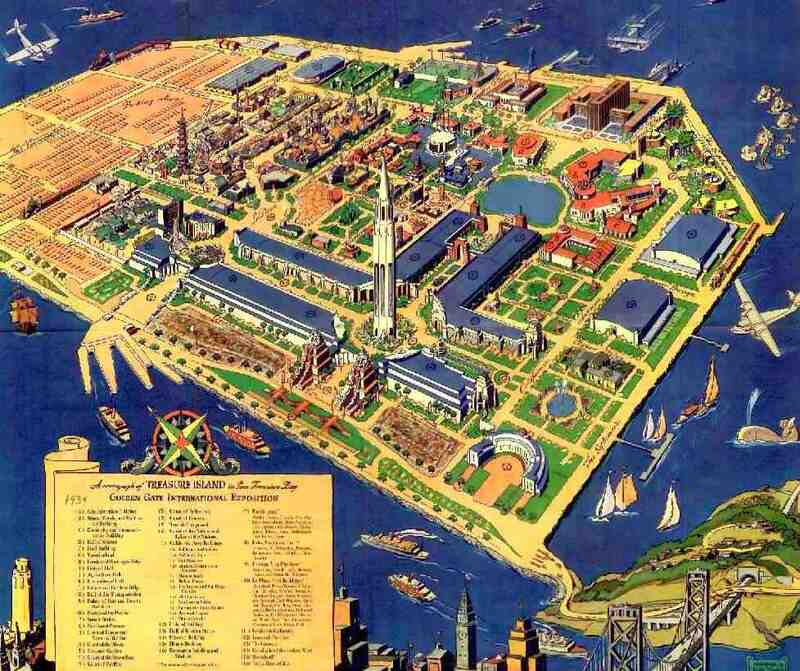 A 1939 map of the Golden Gate International Exposition at Treasure Island, showing the seaplane hangars & terminal on the right. A March 1939 photo by Gordon Williams of a Pan Am Boeing China Clipper on its 15 ton beaching cradle being preparing for its christening at Treasure Island (courtesy of Kevin Walsh). A March 1939 photo by Gordon Williams of 2 Pan Am China Clippers (a Martin & a Boeing) moored at Treasure Island (courtesy of Kevin Walsh). 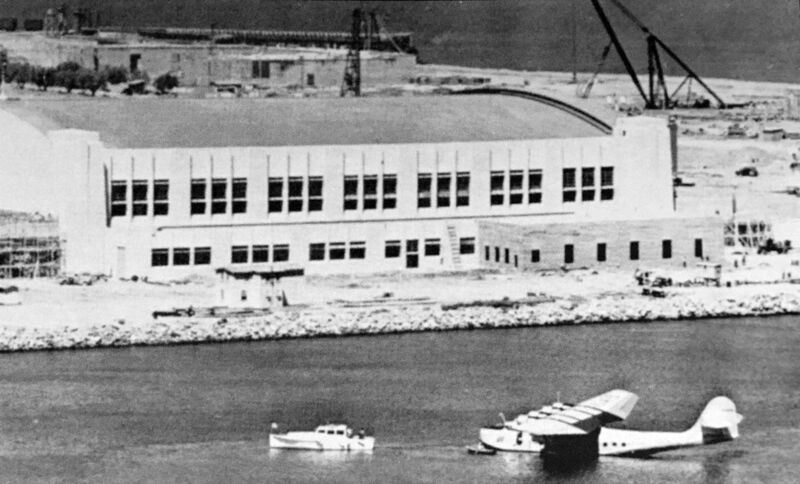 A circa 1939 aerial view looking north at a Martin M-130 flying boat moored in front of a Treasure Island hangar (courtesy of Kevin Walsh). The Exposition grounds were still under construction in the background. 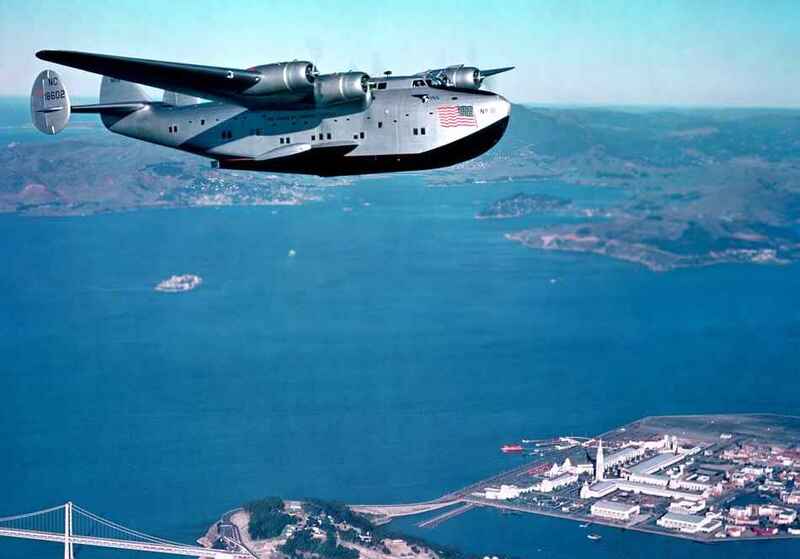 A 1939 photo of a Martin M-130 flying boat at Treasure Island (from the San Francisco Library via Rex Ricks). 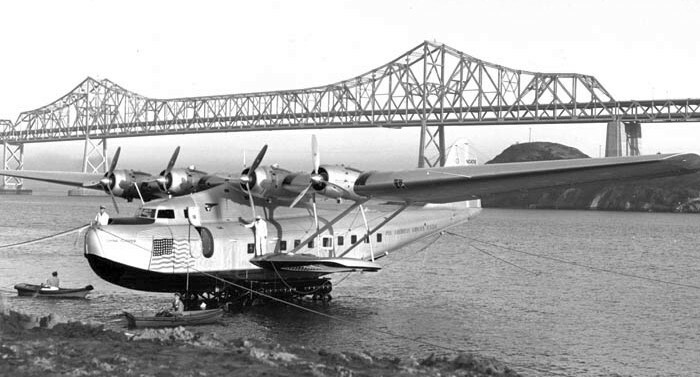 A circa 1939 photo by Bill Larkins of a Martin M-130 China Clipper being moored at Treasure Island. and a 3,300' landplane runway on the north end. 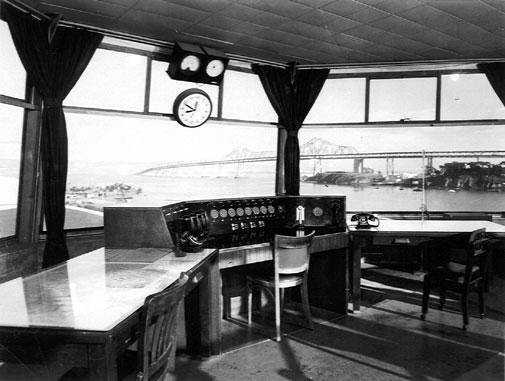 Pan Am moved to Treasure Island from Alameda in 1939.
featuring a spectator's gallery to view their aircraft maintenance work. on public display in front of the Federal Building at the Treasure Island Golden Gate International Expo, resplendent in a polished natural metal finish. 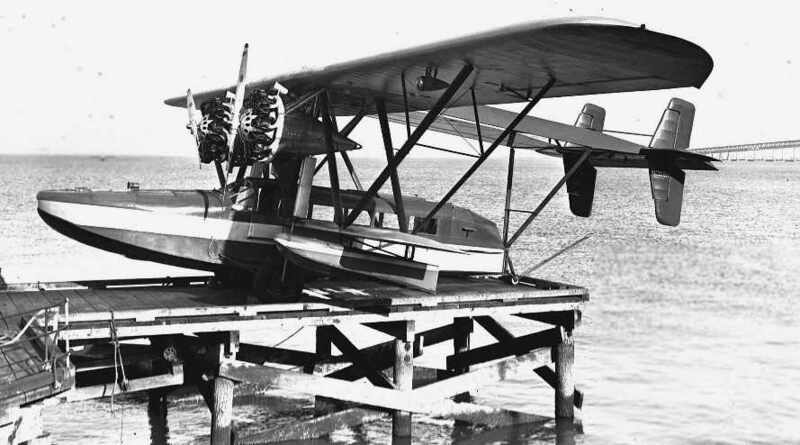 This is the only fixed-wing aircraft of which any photos have been located at Treasure Island. A 1939-40 photo by Bill Larkins of a Sikorsky S-38 flying boat at Treasure Island. Bill recalled, “Paul Mantz had an active flight service at Treasure Island in 1939-40 on the East side of the Island. 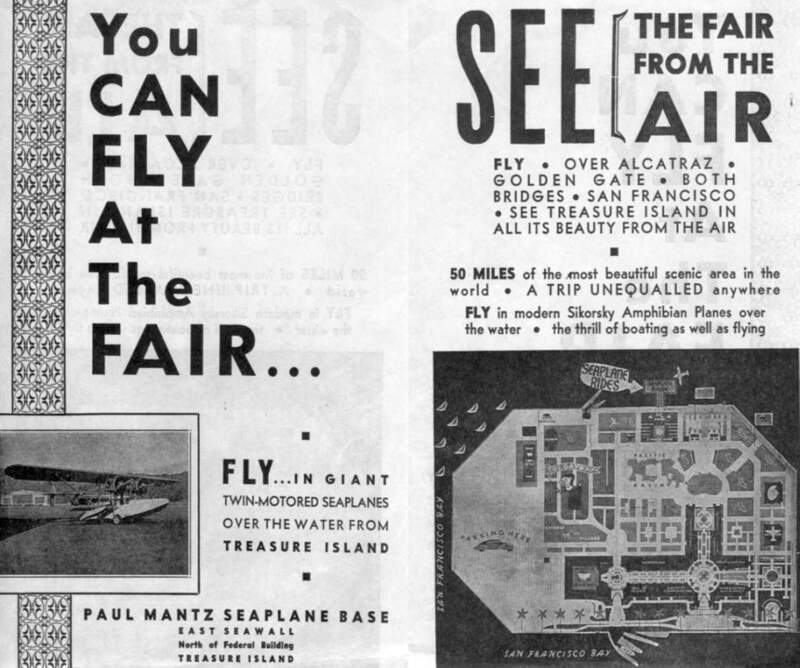 They sold sight seeing flights for the people at the Golden Gate International Exposition. A circa 1939-40 brochure for the Paul Mantz Seaplane Base on Treasure Island (courtesy of Tom Heitzman). The Golden Gate International Exposition at Treasure Island concluded on 9/29/40. Craig recalled, "The picture was taken by my father, Robert Knight, who worked for Pan Am at the time the picture was taken." 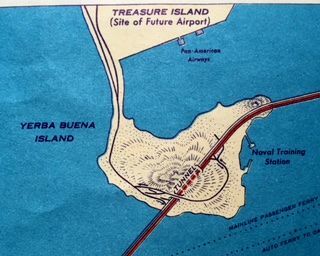 A 1940 street map (courtesy of Kevin Walsh) depicted “Treasure Island (Site of Future Airport)”. with the Tower of the Sun in the background. 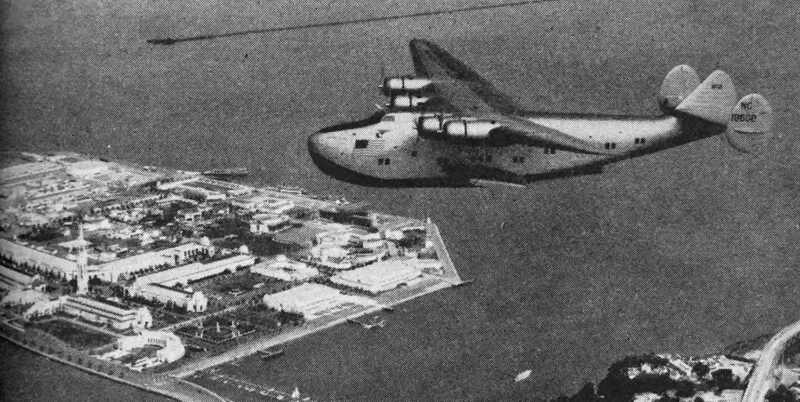 A circa 1940 aerial view looking north at a Boeing 314 flying boat overflying Treasure Island. A circa 1940 aerial view looking northeast at a Boeing 314 flying boat overflying Treasure Island. 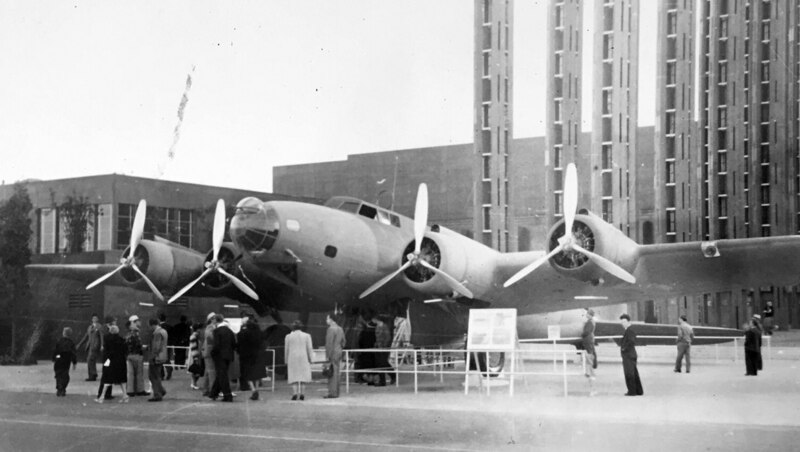 A 1940 photo by Bill Larkins of the prototype Boeing YB-17 Flying Fortress on display in front of the Federal Building at the Treasure Island Golden Gate International Expo. At some point between 1939-40 the YB-17 had been repainted in camouflage. 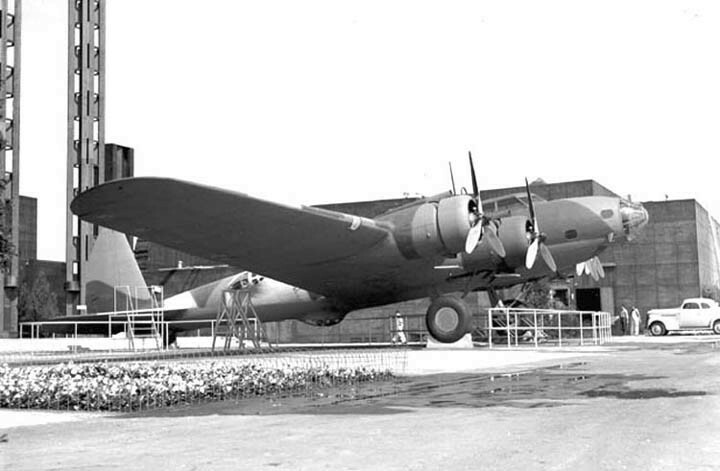 A 1940 photo (courtesy of Kevin Walsh) of the prototype Boeing YB-17 Flying Fortress on display in front of the Federal Building at the Treasure Island Golden Gate International Expo. with the exception of the 2 aircraft hangars. 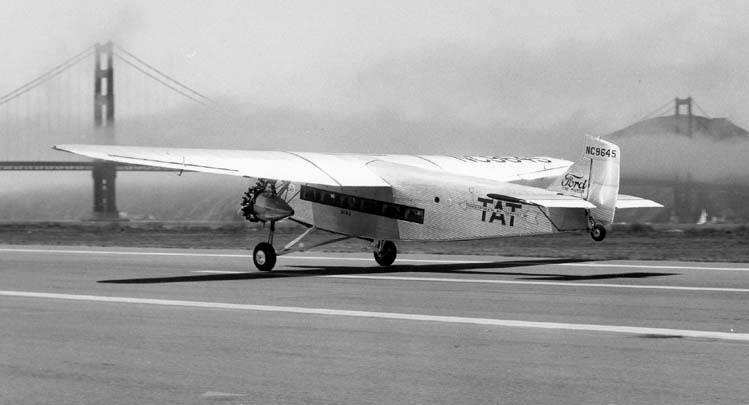 Following the nation's entry into WW2, the Navy placed Pan Am under contract in 1942, and commandeered its aircraft. 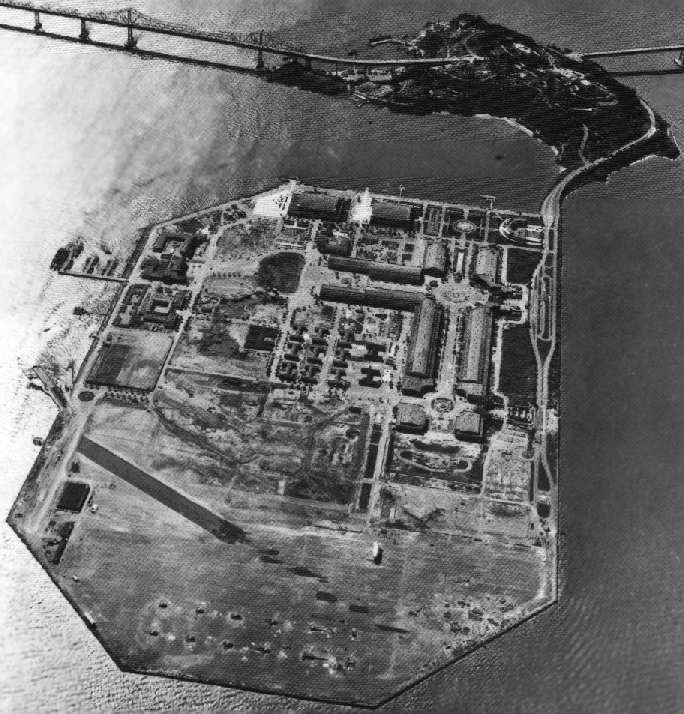 Treasure Island was commissioned as a Naval Auxiliary Air Facility. to operate blimps on antisubmarine patrols of approaches to San Francisco Bay. and the landplane runway on the north end, with a blimp on the right side of the airfield. Martin M-130 China Clippers, Boeing 314s, and Navy supplied PB2Y-3R Coronados. The M-130s operated a shuttle service between Treasure Island & Honolulu. 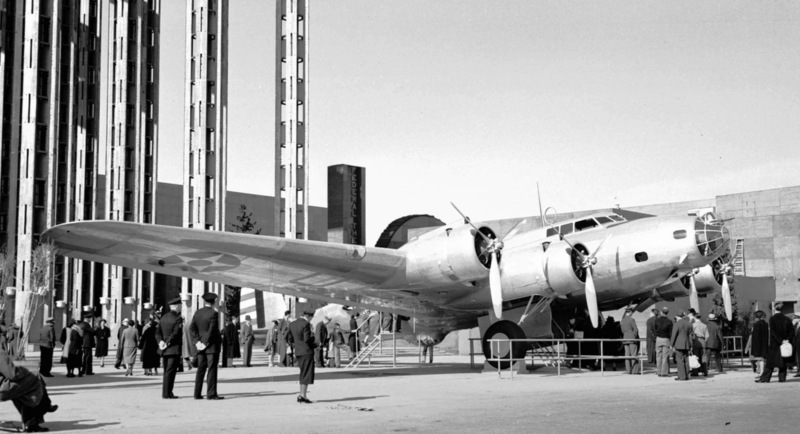 regular Pan Am flight operations were moved to Mills Field (San Francisco International Airport today) in 1944. 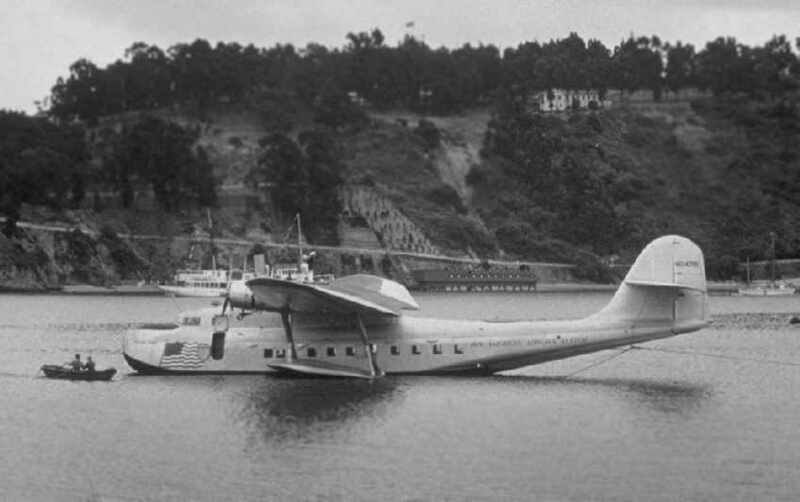 Treasure Island remained in use by Pan Am for seaplane overhaul. was a July 1944 photo of a four camouflaged Boeing 314 flying boats moored at Treasure Island. depicted both the “Treasure Island (Navy)” airfield & the “Pan American” seaplane facility. Wartime naval construction eventually took over all of Treasure Island. The primary mission of the Navy facility became the processing of personnel heading to & from the Pacific. At its peak, 12,000 people per day passed through the station. from an undated wartime flier entitled “Treasure Island Naval Training & Distribution Center” (courtesy of Kevin Walsh). After WW2 Treasure Island housed various activities supporting Naval & Marine forces in the bay area. 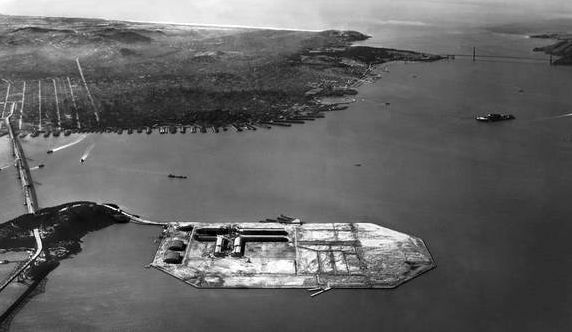 A 1946 aerial view looking north showed the Treasure Island hangars in the foreground, and the barely recognizable trace of a runway on the north side of the island. Two smaller hangars had been built just northeast of Building 1 at some point between 1942-46. 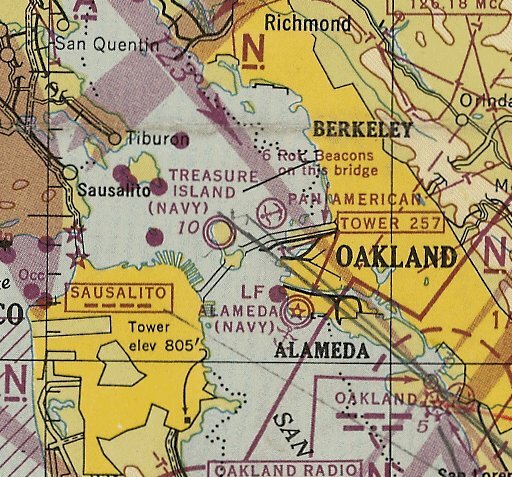 The last aeronautical chart depiction which has been located of Treasure Island was on the January 1946 San Francisco Sectional Chart (courtesy of Kevin Walsh). It depicted the “Treasure Island (Navy)” seaplane facility, but no longer depicted the landplane airfield. 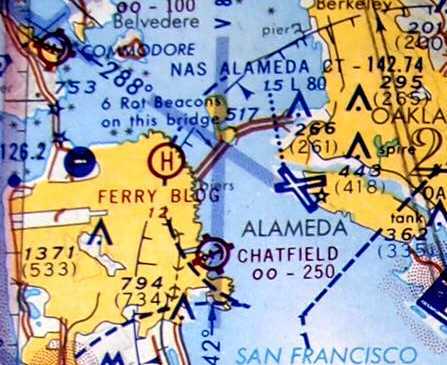 The 1946 Sacramento Sectional Chart (courtesy of Dallam Oliver-Lee) no longer depicted any aviation facilities on Treasure Island. A circa 1947-53 aerial view looking west at a Grumman F6F Hellcat, North American FJ1 Fury, and Chance-Vought F4U Corsair from NAS Oakland overflying Treasure Island (courtesy of John Voss). 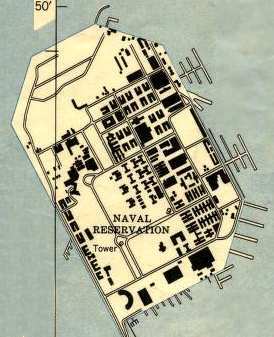 The 1949 USGS topo map did not depict any airfield facilities on the island. 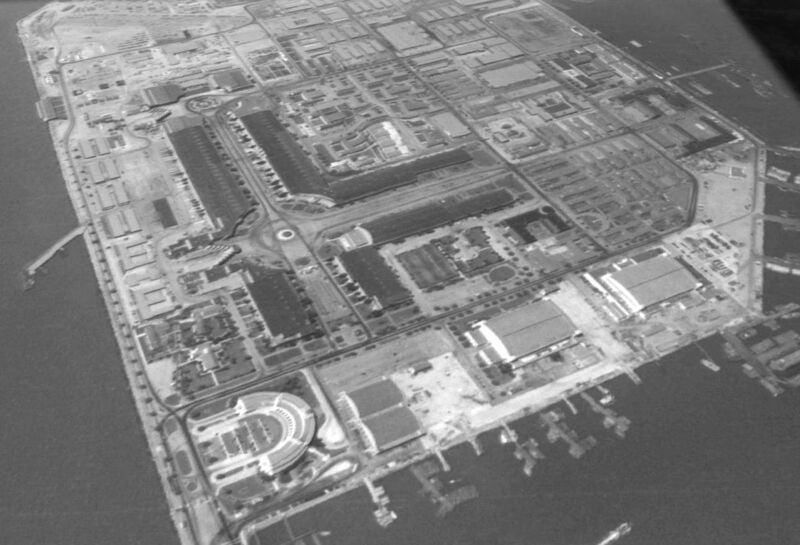 A 1975 aerial view looking northwest at Treasure Island (courtesy of Jonathan Westerling) showed the heliport in the foreground in front of the seaplane hangars. the top-secret effort mounted by the Central Intelligence Agency to salvage the remains of the Soviet submarine K-129 from the ocean floor. The HMB-1 was designed to allow the device that would be used to grasp and lift the submarine to be constructed inside the barge and out of sight, and to be installed in the Glomar Explorer in secrecy. was used as Berlin's Tempelhof airport in the third Spielberg-Lucas Indiana Jones adventure, Indiana Jones & the Last Crusade (1989). An undated photo (courtesy of Anne Schnoebelen) of a 2/18/90 historical plaque commemoratig Treasure Island. In 1993 the Department of Defense decided to close the Naval Station & return it to civilian use. to provide recreation, open space, economic development, and other publicly oriented uses. have been used in recent years for television & movie filming. and also as a sound-stage & offices for the 'Nash Bridges' TV show." "other parts of Treasure Island were also depicted in the movie as being the 'Joint Tactical Force West' base." A 2003 photo by Tim Tyler of Treasure Island's Building 1 & hangars, as viewed from the mainland. Tim Tyler visited Treasure Island in 2003. His report: "I've explored Treasure Island quite a bit, via car, foot, and best of all, bicycle. As best as I can tell, there aren't any obvious remains of the NAAF area. some Training School facilities, an elementary school, and I think also the island's wastewater treatment plant." A 2003 photo by Tim Tyler of Treasure Island's Building 1. A 2003 photo by Tim Tyler of the control tower which remains atop Building 1. 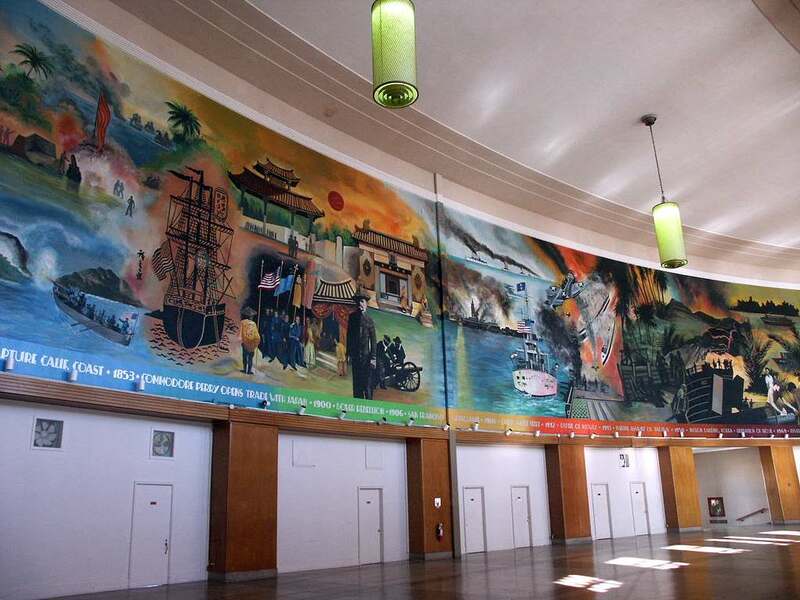 A 2003 photo by Tim Tyler of a beautiful WPA-style mural which remains in the lobby of Building 1. 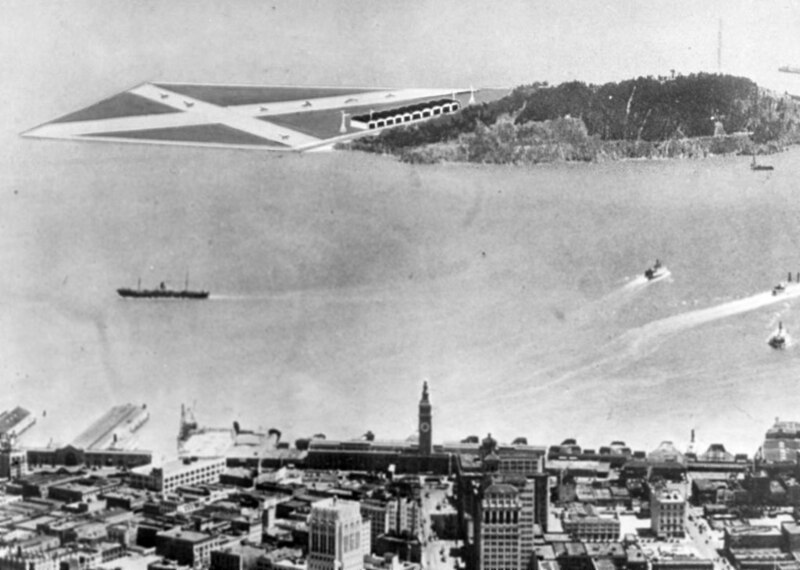 "Of course, there is plenty of evidence remaining of the original plan to use the island as San Francisco's main airport. and is right next to the little cove that the seaplanes used. The seaplane ramps are long gone. 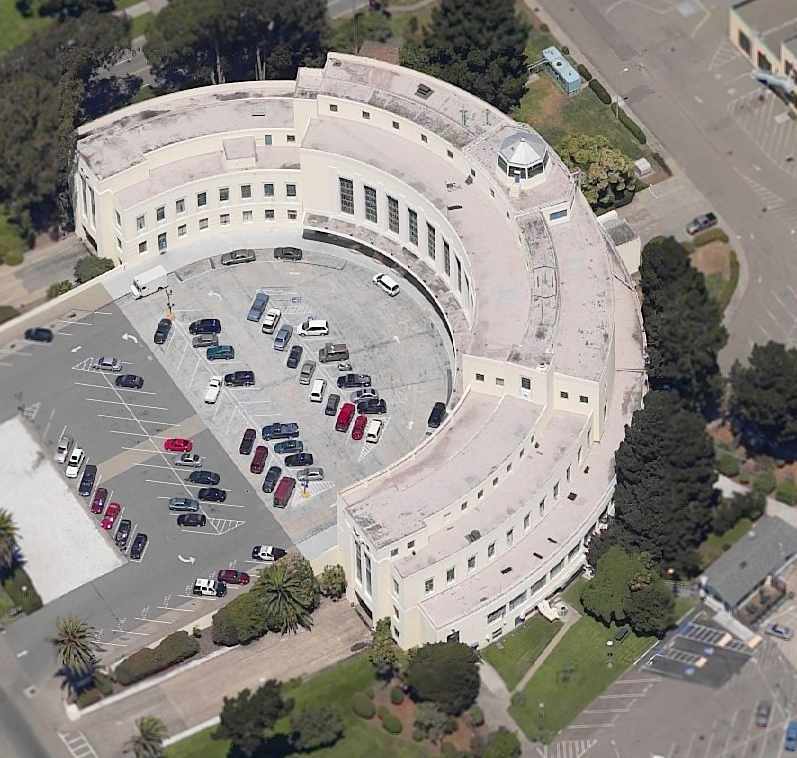 Building 1 was Naval Station Treasure Island's administrative & operational headquarters. Admiral Nimitz's command center during WW2 was a series of hardened rooms in the basement of Building 1.
for HQ 12th Naval District operations until the base closed in the late 1990s." while other family housing sections are closed off & boarded up. and other buildings already turned over to SF are simply awaiting redevelopment." 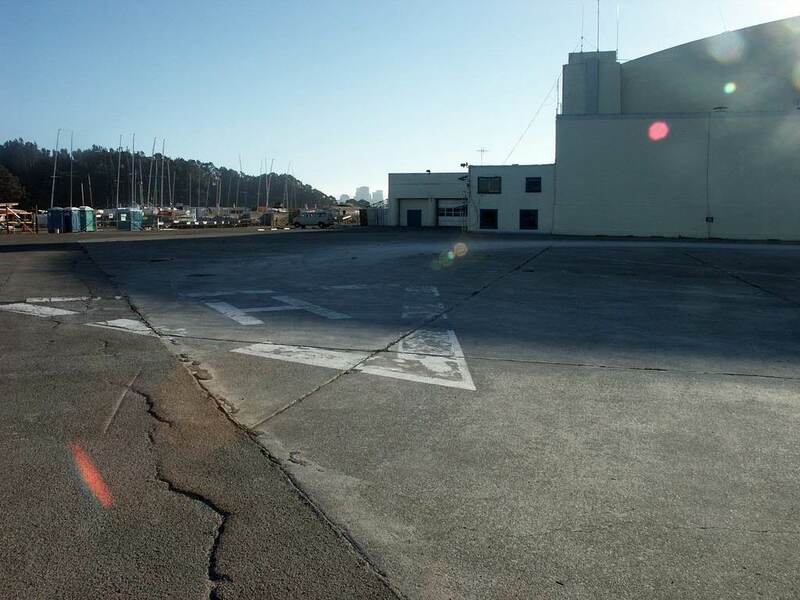 A 2003 photo by Tim Tyler of the helipad which remains in front of Treasure Island's Hangar 3. A 2003 photo by Tim Tyler of the interior of one of Treasure Island's hangars. 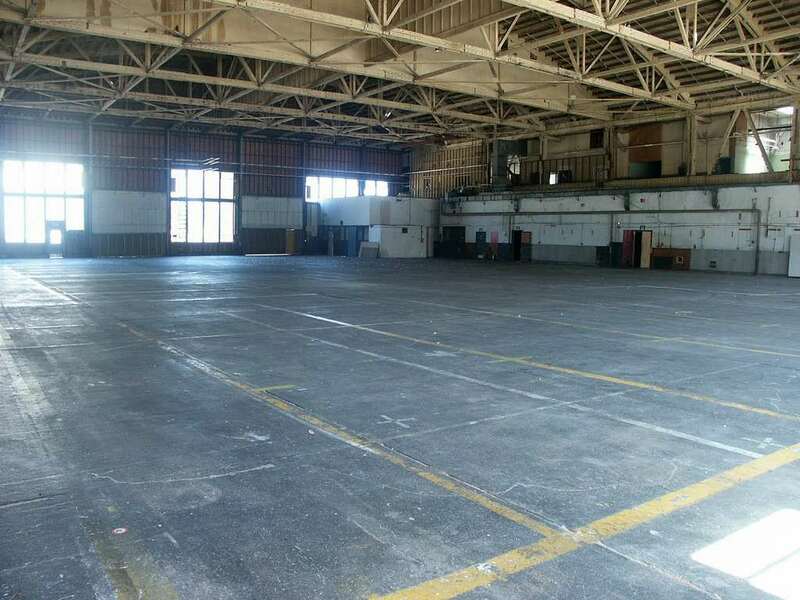 "The large hangars built to be used as San Francisco's airport are mostly empty now." 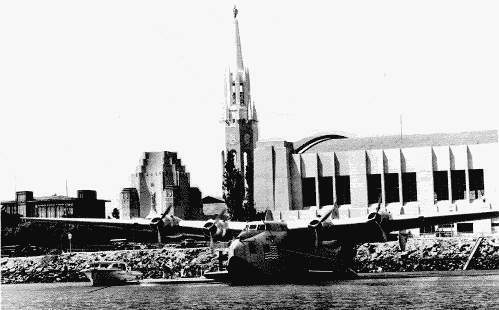 but the 2 Pan Am seaplane hangars remained standing on the south end. was using one of Treasure Island's former hangars to film the movie 'Rent'. A circa 2005 aerial photo looking north at Treasure Island's Building 1. 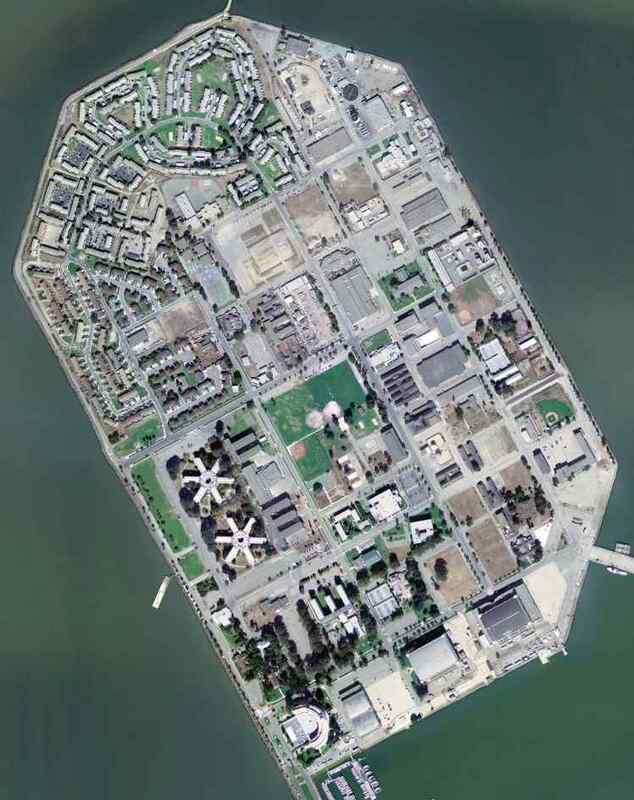 A circa 2005 aerial photo looking north at several of Treasure Island's hangars. 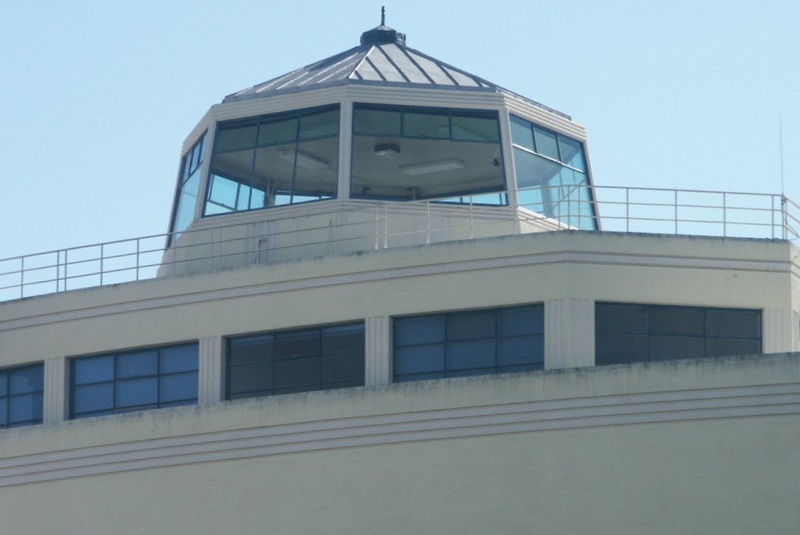 A March 2014 photo by Viv Sherwood of the control tower which remains atop Building 1. A March 2014 photo by Viv Sherwood of “one of the events that happens here at Treasure Island once a month - it’s a very popular flea market. During Summer Months it moves away from Building One further down the road. There are also music festivals from time to time & lots of weddings - for beautiful photographic backdrop of Treasure Island & the City of San Francisco. 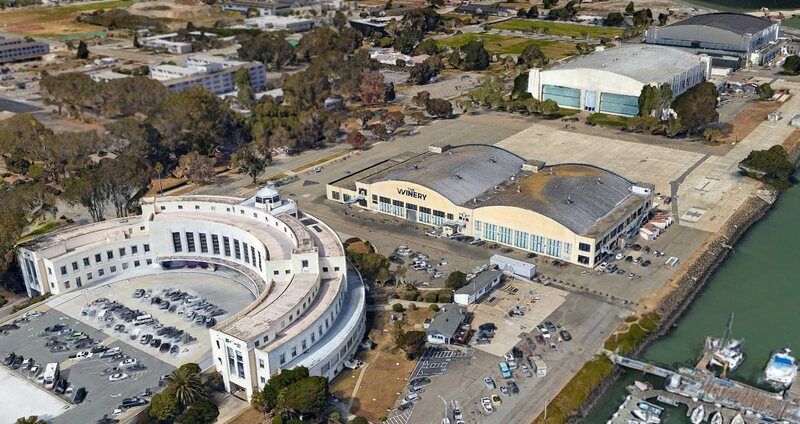 A 2016 3-D aerial view showed that all 4 of Treasure Island's hangars remained intact. 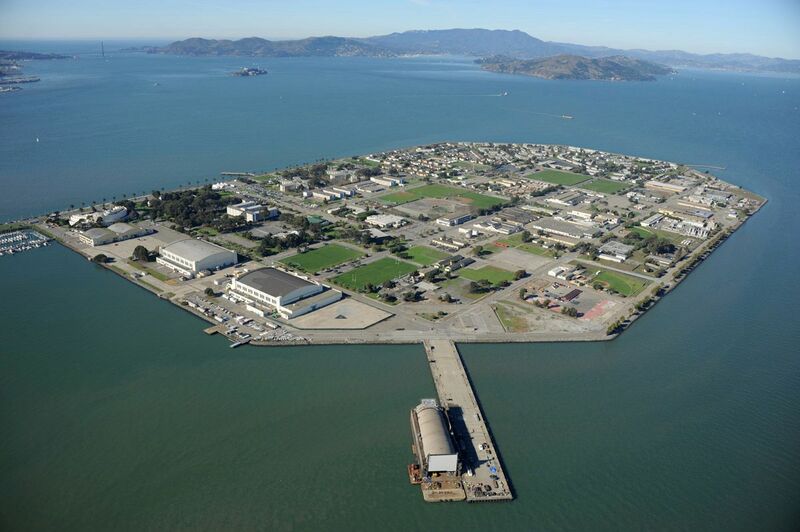 A 2017 aerial photo of Treasure Island, showing that the hangars just northeast of Building 1 had been removed at some point between 2016-2017.
showing the “Aviation & Athletic Field” which would eventually become Crissy Field. adjacent to the shore of the San Francisco Bay & just SE of the Golden Gate Bridge. Note that this 1913 map may very well be the earliest map depiction to have been made of an American airfield. 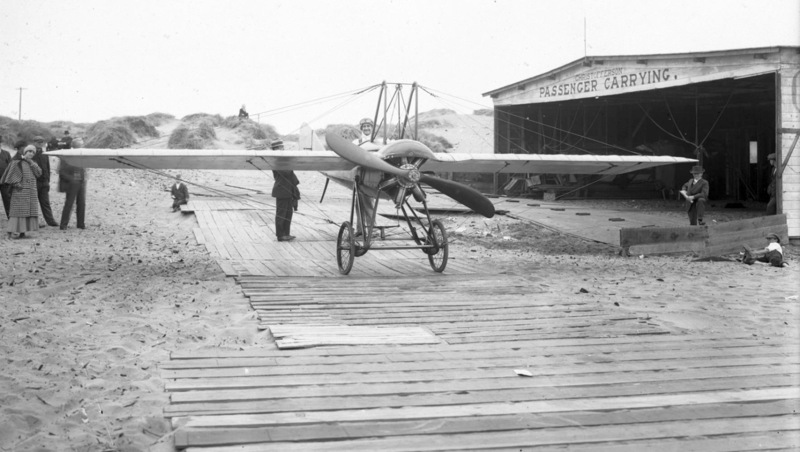 of an unidentified single-engine monoplane on wooden planks in front of a hangar marked “Christofferson Passenger Carrying”. 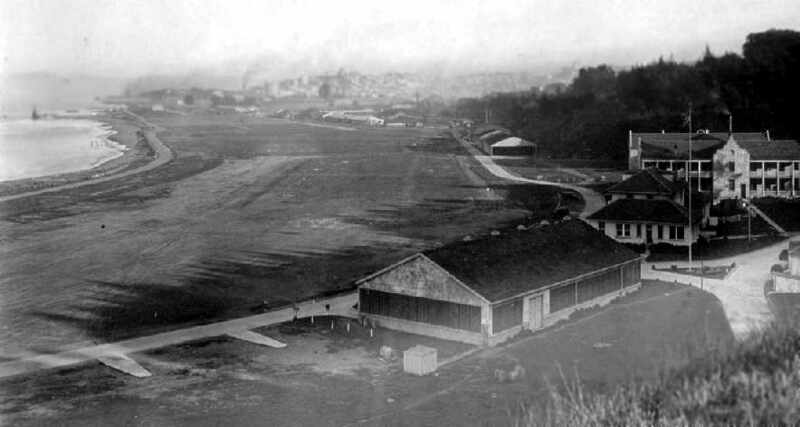 A circa 1915 photo (courtesy of Kevin Walsh) looking southeast at hangars on the west side of Crissy Field with the runway in the background. A circa 1915 photo (courtesy of Kevin Walsh) of a crowd watching a biplane (model unidentified) at Crissy Field. showing the “Drill Ground & Aviation Field” on the west side. an airfield whose mission would be to cooperate with the artillery defenses of San Francisco Bay. observe & correct the fire of our big guns on the coastal bluffs, and pass messages to troops in the field. 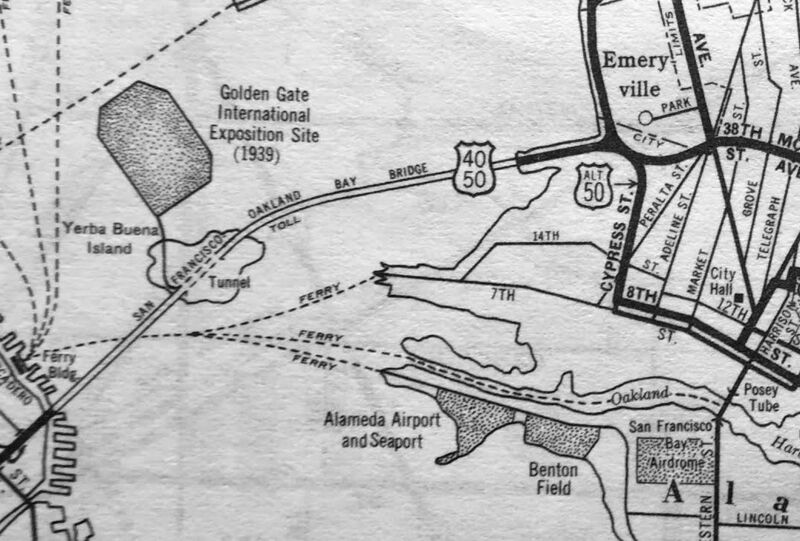 A 1919 Chamber of Commerce map (courtesy of Kevin Walsh) showed a road bisecting the Aviation Field which would eventually become Crissy Field. a young major destined to lead the largest air force the world has ever known during WW2. The original facilities consisted of a kidney-shaped field on which the outline of the former racetrack was still visible. a wide expanse planted in grass to soften the landing & to slow the plane after touchdown (no brakes in those days!). the field's southern edge was lined with hangars for seaplanes & landplanes, workshops, and a garage. and a guardhouse built in attractive Mission Revival style. were bachelor officers' quarters & a row of small homes for married officers. inspected the new installation & pronounced it "the last word in airfields." 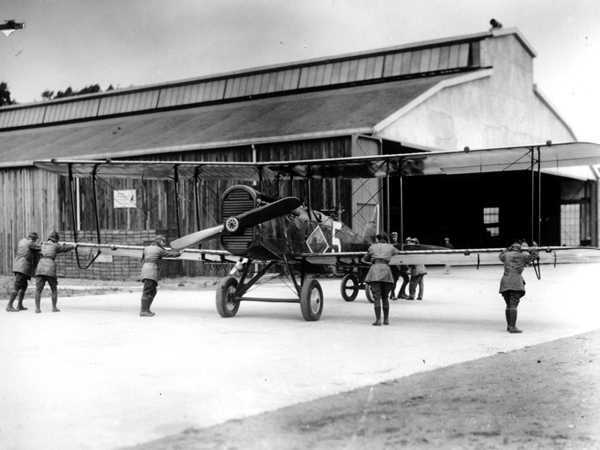 A 1921 photo of Army aviators pushing a deHavilland DH-4 back into a Crissy hangar. 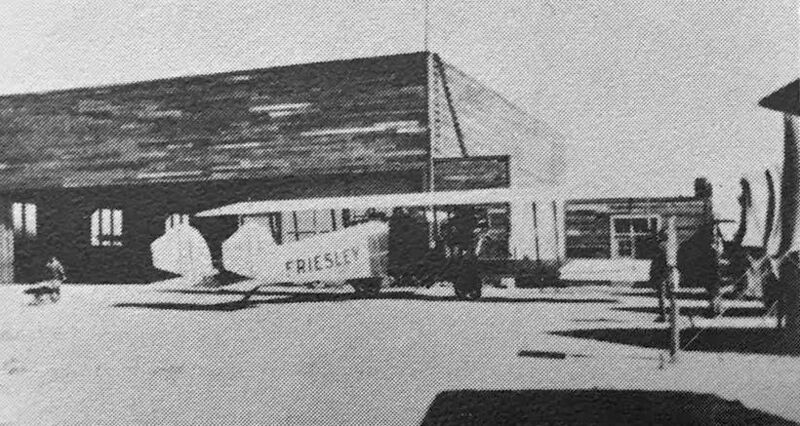 A 1921 photo of the Friesley “Falcon” biplane in front of the Crissy Field Air Mail hangar, from the 1926 Aeronautical Chamber of Commerce of America Aircraft Yearbook (courtesy of Kevin Walsh). with the buildings of San Francisco visible on the hills in the background. 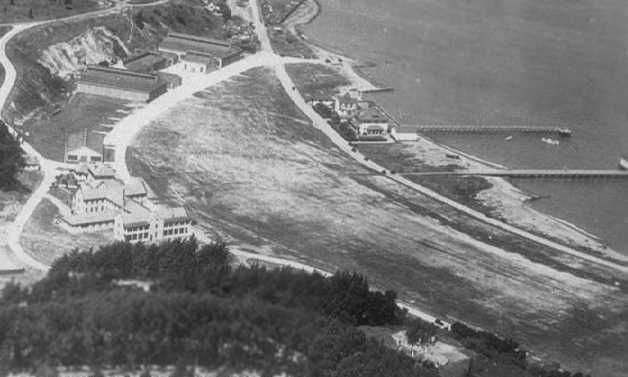 A circa 1921 aerial view looking southeast at Crissy Field (National Archives photo). and the administrative headquarters lies directly to the west. The large hangars at the west end housed seaplanes. The line of houses in the foreground were the pilots quarters. Biplanes lined up on Crissy Field in the 1920s. such as search-and-rescue & publicity flights; and support for the U.S. Air Mail Service. and participated in the dedication of Lassen National Park from the cockpits of their flying machines. securely in the record books of aviation history & contributed to the growth of the modern aviation industry. 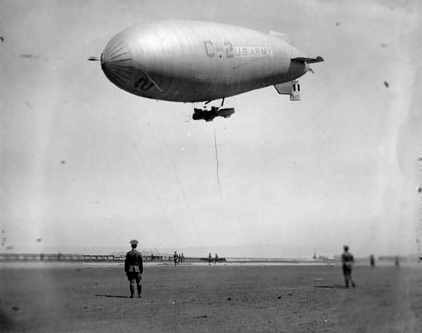 A circa 1923 photo of an Army C-class blimp at Crissy Field (from the San Francisco Library via Rex Ricks). 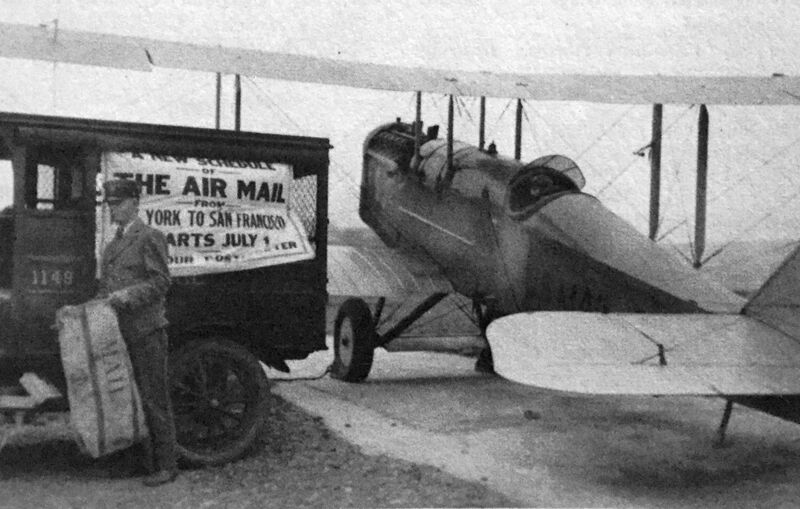 A 7/2/24 photo (courtesy of Kevin Walsh) of the first dawn-to-dusk transcontinental flight arriving at Crissy Field, delivering air mail. had taken a giant practical step forward. with Lieutenant Lowell Smith of Crissy Field leading the flyers upon their return. This was "the most important pioneering flight of the time in terms of difficulty & international prestige." In 1925, 2 navy seaplanes took off from Crissy Field in the first attempt to fly from the mainland to Hawaii. and was only partially completed by one plane, whose flyers had to be rescued at sea. Two years later, they tried again. the Bird of Paradise, at Crissy Field & flew non-stop to the islands. A 1925 view looking east along Crissy Field (from the San Francisco Library via Rex Ricks). 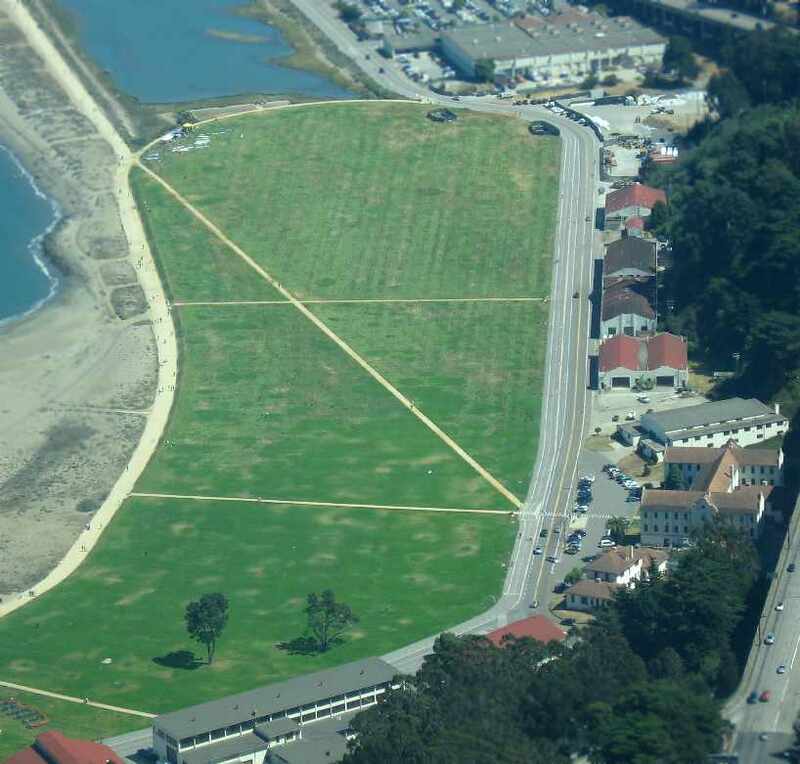 described Crissy Field as a "Permanent" airfield, with an east/west runway measuring 1 mile x 750'. The field was said to have several hangars on the extreme west end of the field & the south edge of the field. The field was said to be "available only as an emergency field for other than Government planes." 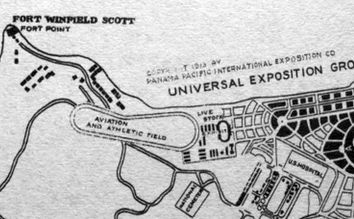 A 1928 plan depicted Crissy Field as having an east/west unpaved runway with hangars along the south side of the field. 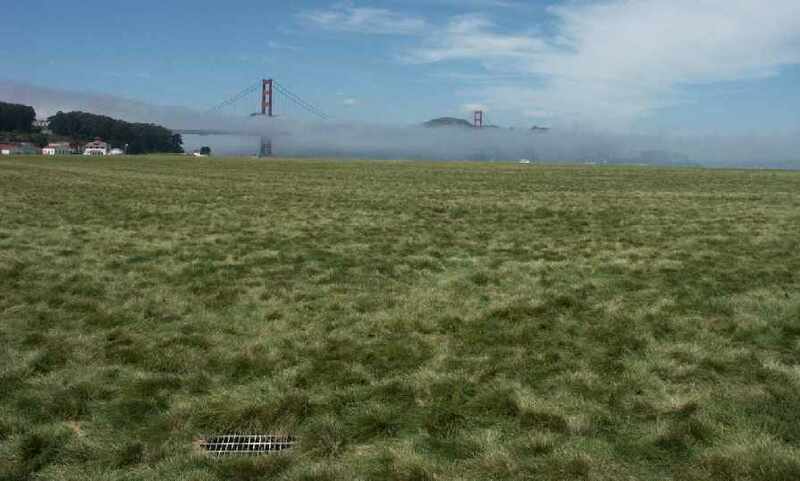 described Crissy Field as measuring 3,050' x 400'. An undated aerial view looking east at Crissy Field from the 1929 Richfield Airport Directory (courtesy of Jonathan Westerling). with “Crissy Field” painted on the hangar roof. 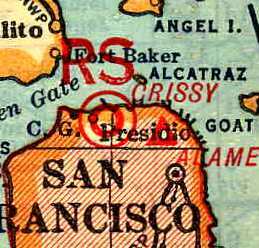 Crissy Field was depicted as a military airfield on the 1933 San Francisco Airway Map (courtesy of Chris Kennedy). A 1934 aerial view looking northwest at the grass runway of Crissy Field. 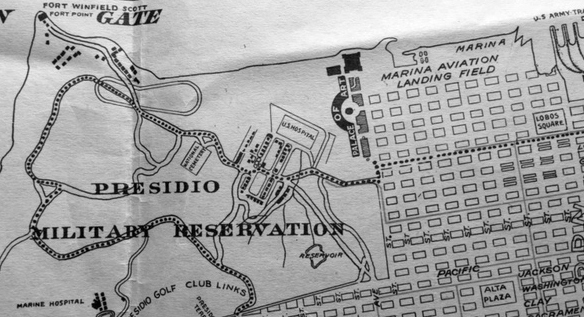 A 1935 street map (courtesy of Kevin Walsh) depicted Crissy Field as an irregularly-shaped property outline, labeled simply “Aviation Field”. 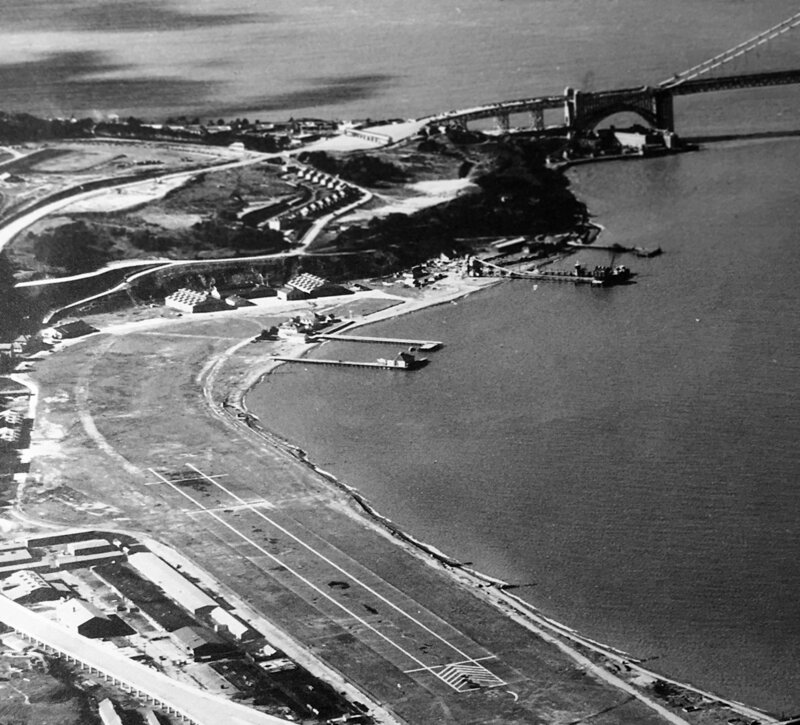 A beautiful circa 1935 aerial view looking northwest at Crissy Field, with the Golden Gate Bridge under construction in the background (courtesy of Kevin Walsh). 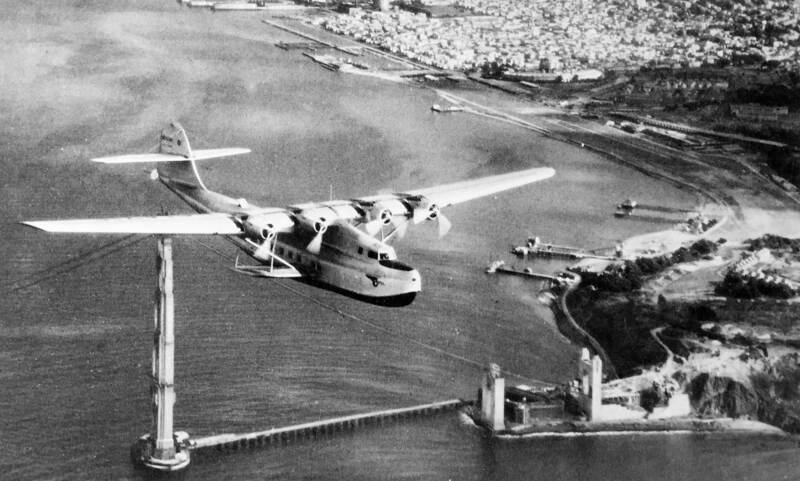 on the occasion of its first westbound flight, with Crisy Field visible in the background. 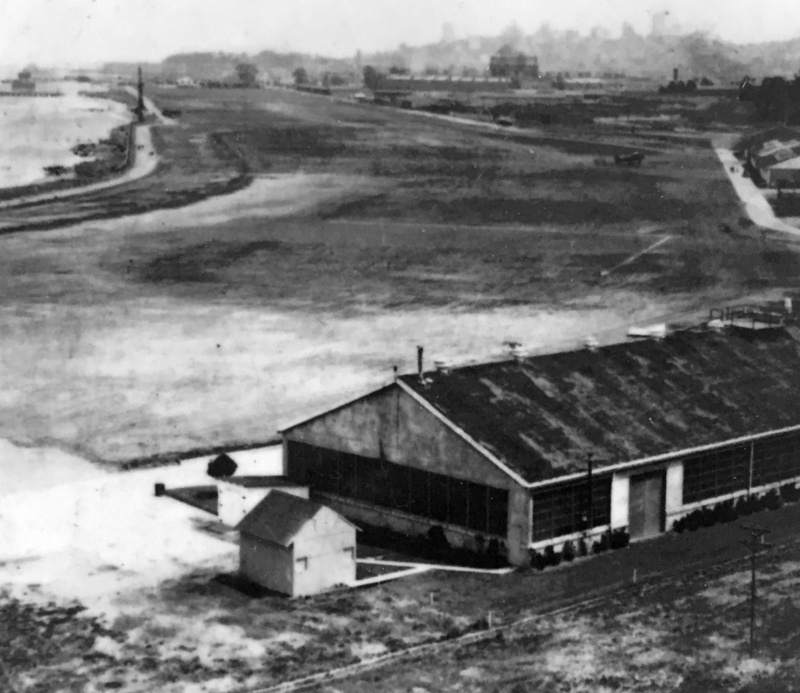 By 1936, Crissy Field was no longer being used as a 1st-line air base. also made it vulnerable to enemy bombardment by sea. 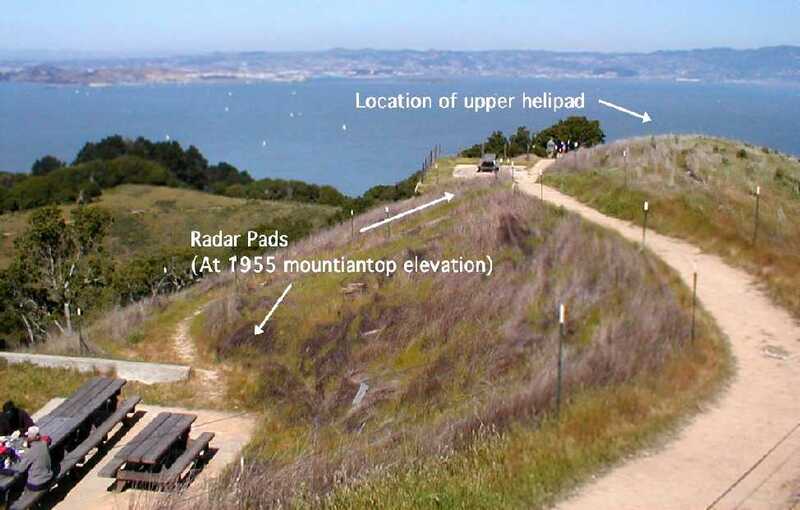 and the activation of Hamilton Field in Marin County offered an up-to date alternative location for the air corps. 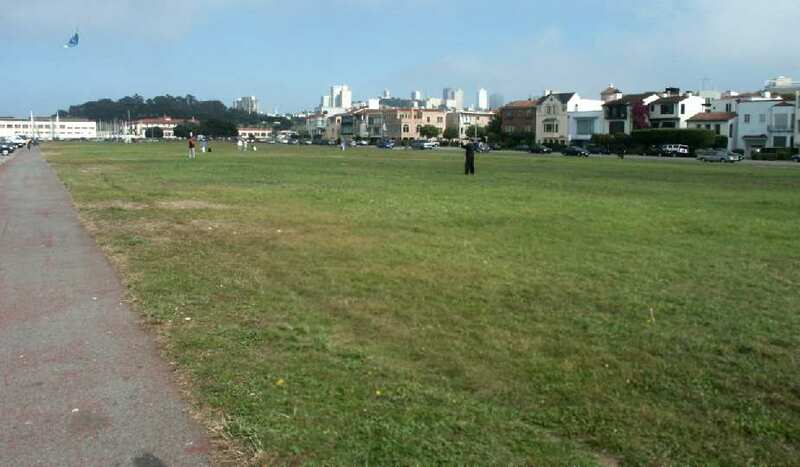 Crissy Field's observation & pursuit squadrons were transferred to Hamilton Field. described Crissy as consisting of a 5,000' x 400' sandy loam field, with a 2,000' landing mat. and the remarks included, "Field temporarily closed due to construction." with the grass runway prominently marked, and checkerboard-roofed hangars at the west (far) side. 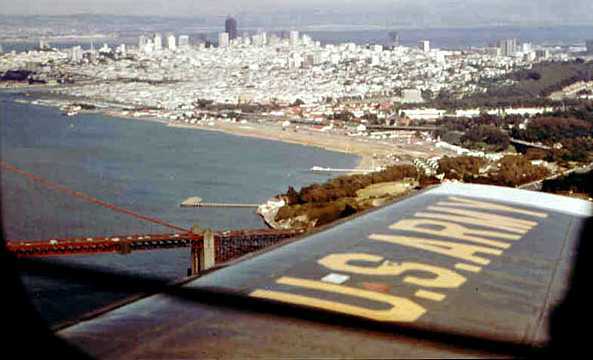 and a checkerboard-roofed hangar at bottom-right marked with “Crissy Field”. and the landing field was routinely used as an assembly area for troop mobilization. and more of the landing field was paved. for the army's top-secret Military Intelligence Service Language School. or on the 1946 Sacramento Sectional Chart (courtesy of Dallam Oliver-Lee). but with some sort of paved surface on the south side that curved over the western portion of the runway. A total of 4 single-engine aircraft were visible in the foreground, including one turning onto the runway. 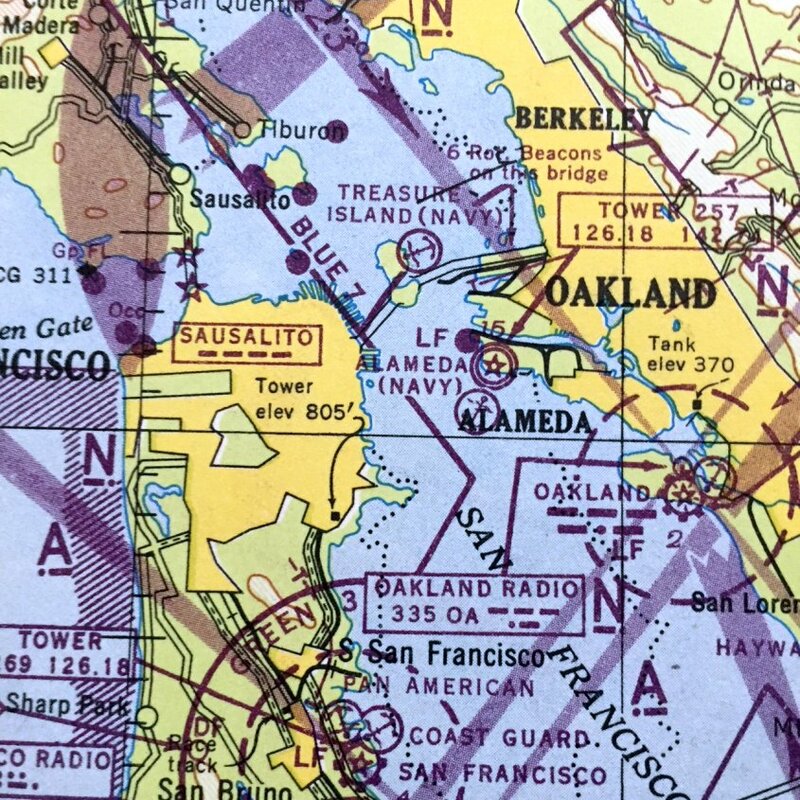 Crissy Field still was not depicted at all on the 1948 San Francisco Local Aeronautical Chart (courtesy of Tim Zukas). 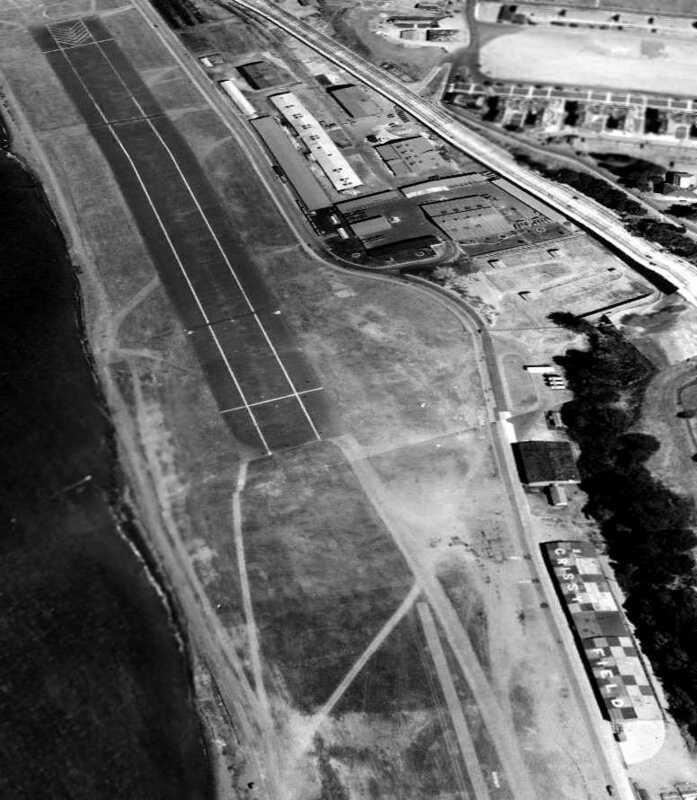 A 1956 aerial view showed that Crissy Field had gained a paved runway at some point between 1946-56. A total of 4 single-engine aircraft were visible parked on the southwest side of the field. from the paved runway that replaced the grass landing field. and medevac flights bringing soldiers wounded in Vietnam from Travis Air Force Base to Letterman Hospital. Tim McCoy recalled, "I was in the Civil Air Patrol as a Cadet in the 1950s. 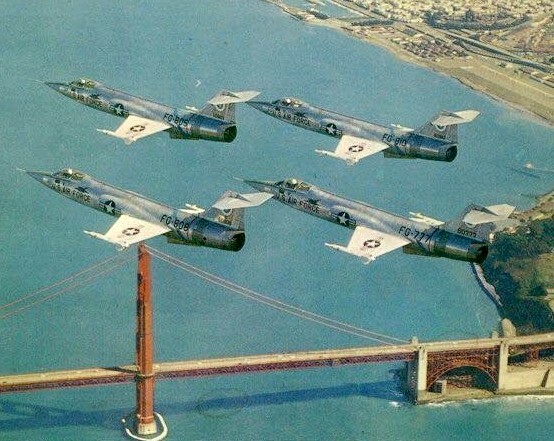 The headquarters for the California Wing of the CAP was at Crissy Field, and they flew out of there also. I got a ride in an L-5 out of there. They had a couple of L-17s, L-5s, and at least one L-16; as well as a Beaver & 310." depicted Crissy Field as having a 2,900' paved runway & a control tower. from the 1960 Guide to Hamilton AFB (courtesy of Kevin Walsh). along with a ramp with 2 small buildings on the east side of the field. An undated (1960s?) aerial view looking east at Crissy Field, showing a twin-engine Beechcraft & a Hiller OH-23 helicopter next to several small buildings & a small hangar. and 5 single-engine aircraft were visible parked on the southwest ramp. 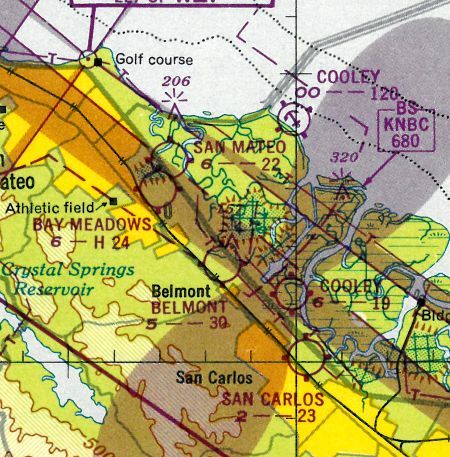 Crissy Field was depicted as an active airfield on the 1967 Sacramento Sectional Chart (courtesy of John Voss). as having a single 2,160' asphalt Runway 6/24. 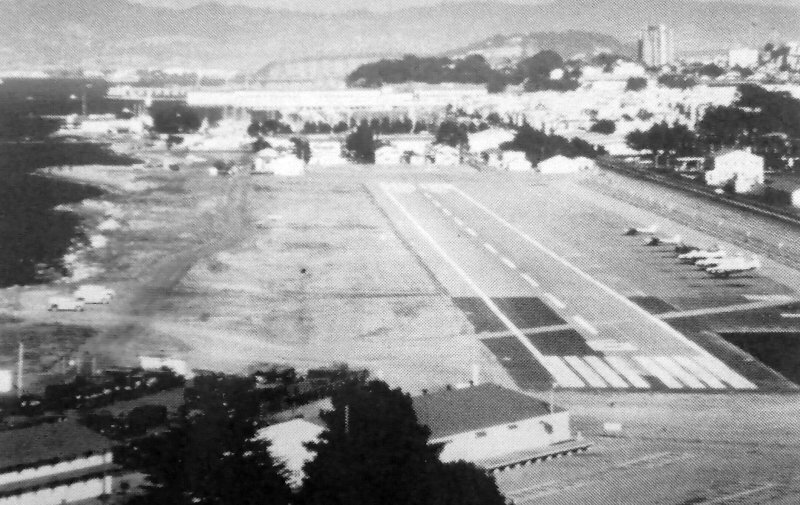 A 1967 photo looking east at Crissy Field (courtesy of Dave Rosenfeld), showing a helicopter left of the runway, and at least 3 light aircraft to the right. CW-4 Robert Cordua recalled, "Little is known about the 'hot shot pilots' that flew in & out of Crissy in twin-engine Beechcraft aircraft. and a missed approach direct to Crissy. Many General Officers sat tight in their seats. I flew out of Crissy during 1967-1968 & I enjoyed the challenge. If there was a incoming flight from another Army station we would take bets on how many passes it would take them to get on the ground. It was the bridge & the hill that looked as if you were not going to make it. If you knew what you were doing it was a piece of cake. I think that experience made me the pilot I am today." A 1968 aerial view depicted 3 single-engine aircraft & 1 helicopter on the south side of the Crissy runway. A 12/1/68 photo of a De Havilland U-6 Beaver at Crissy Field. Don Jordan recalled, “Crissy Army Airfield... I was stationed there in 1968. My job was 'Line Chief'. I was in charge of the aircraft on the flight line. We also had T-41s & Choctaw helicopters stationed there. I think we may have had a couple of Army Beech Barons there also. The De Havilland U-6 Beaver... I had 3 or 4 of them on the flight line, on which I had to do a ground run-up every morning. In all likelihood, I was the crew chief on the aircraft shown [above], as I was there from January to September of 1968. 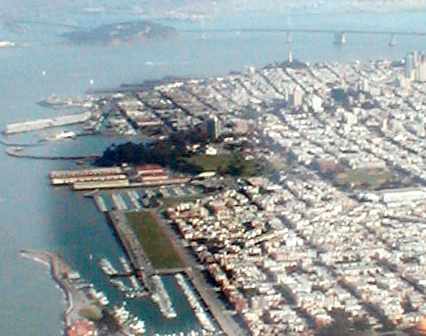 A 1970 aerial view looking east at Crissy Field, with 5 Army aircraft visible on the right (courtesy of Rex Ricks). 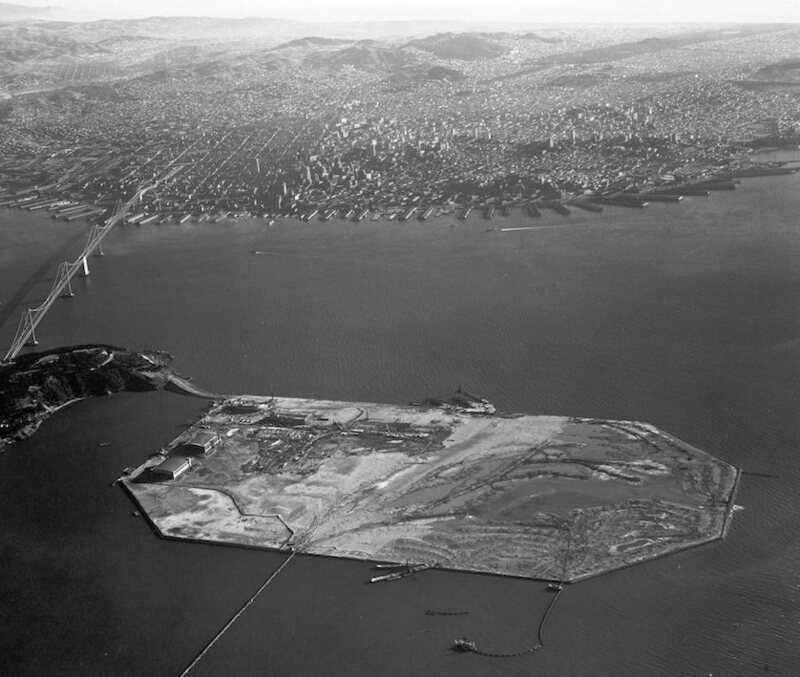 A 1970 aerial view by Bill Comrey looking southeast at Crissy Field. Bill observed, “On final approach to Crissy Field. We were flying in a U-8 twin-engine Beechcraft from Fort Ord. A beautiful 1970 photo by Bill Larkins of Harrah's Ford 5-AT-B Trimotor taking off from Crissy Field. 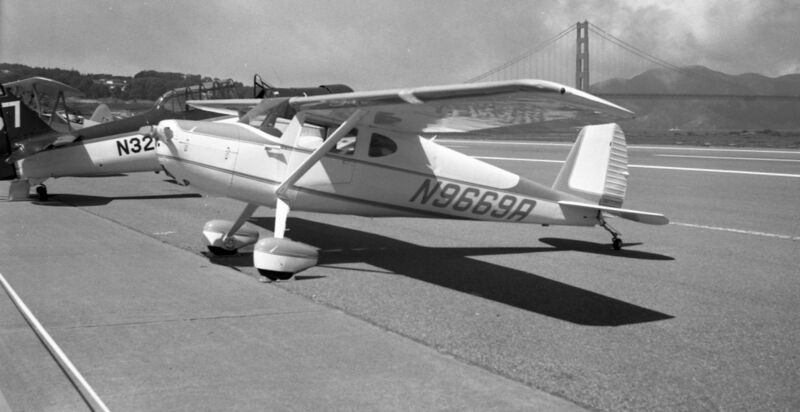 An 8/29/71 photo of N9669A, a 1950 Cessna 140A, serial #15390, at a Crissy Field fly-in. Chuck Ross recalled, "I flew in & out of Crissy several times in the early 1970s. told me that he flew governor Ronald Reagan into Crissy in Citation jet N31ST. I would not have wanted to do that! The runway seemed tight, even in the Beaver." An 8/13/72 photo by Bill Larkins of N9683F, a San Francisco Police Department 1971 Hughes 269C, serial #1010129, at Crissy Field. 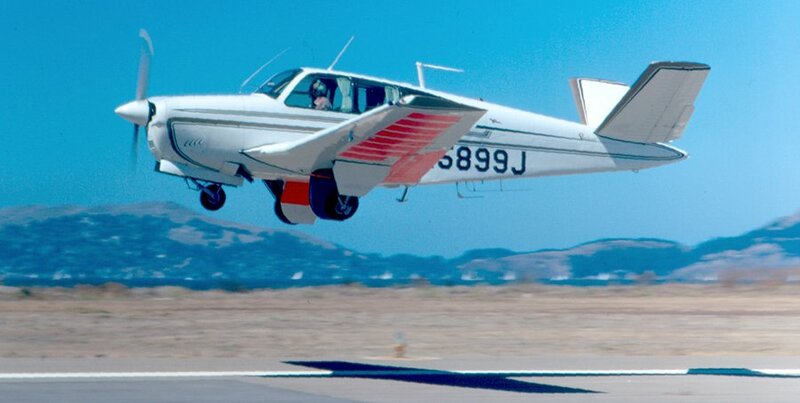 A 1972 photo by Bill Larkins of a Beech S35 Bonanza taking off from Crissy Field. 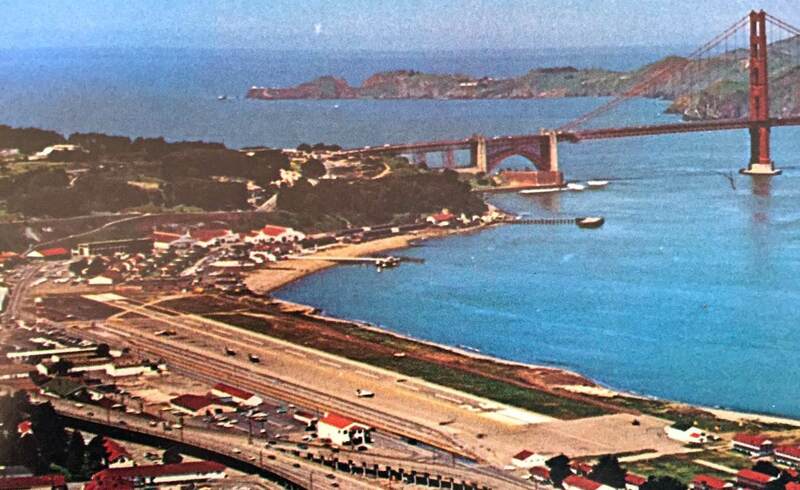 A beautiful 1972 aerial view looking northwest at Crissy Field, with the Golden Gate Bridge in the background (courtesy of Kevin Walsh). What appear to be several helicopters & fixed-wing aircraft are visible to the left of the runway. although some helicopter operations continued after that point. At its closure, the airfield consisted of a single East/West 2,500' paved runway. 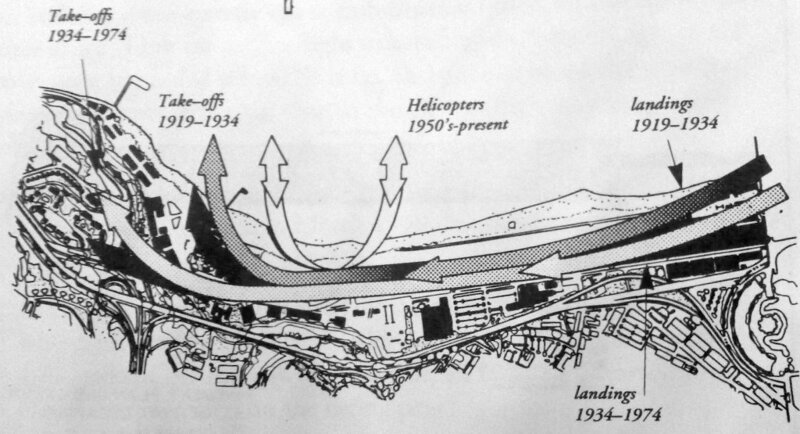 A diagram contrasting Crissy Field's landing & takeoff patterns from 1919 through 1974 (courtesy of Rex Ricks). 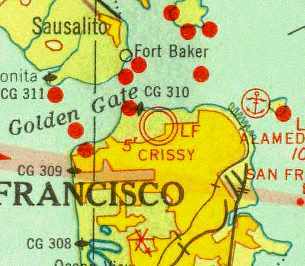 The April 1980 San Francisco Sectional Chart depicted Crissy Army Heliport. 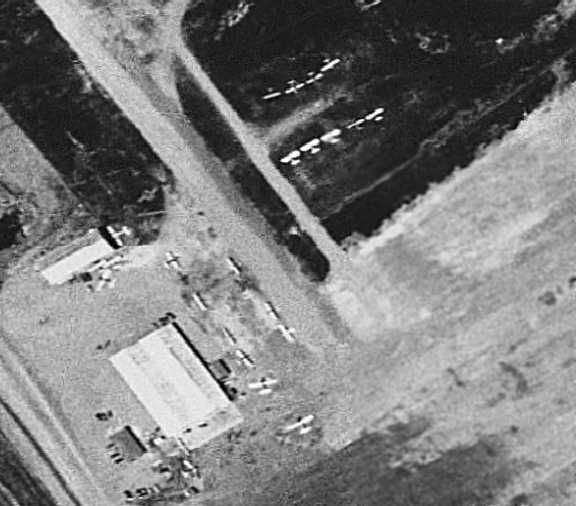 A 1980 aerial view showed a road having been built across the Crissy runway. A 1983 Air Force aerial view looking southeast at Crissy's paved runway (courtesy of Rex Ricks). 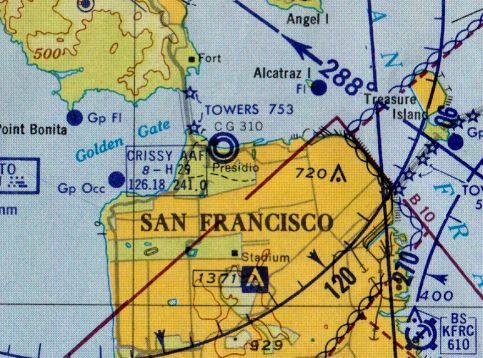 Crissy Field was no longer depicted at all on the 1987 CA Aeronautical Chart (courtesy of John Voss). 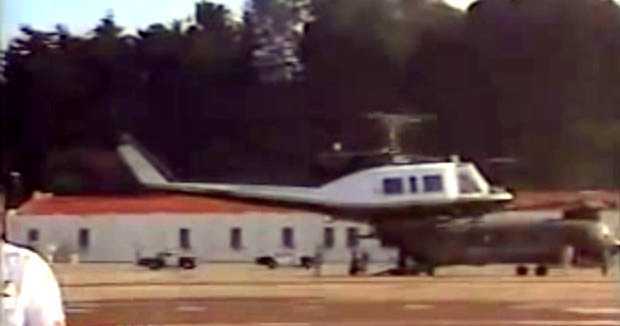 A 1987 video capture (courtesy of Jonathan Westerling) of the Pope landing at Crissy Field in a Bell 212, with a CH-47 Chinook in the background. The entire Presidio base was closed by the Army & turned over to the National Park Service in the 1980s. 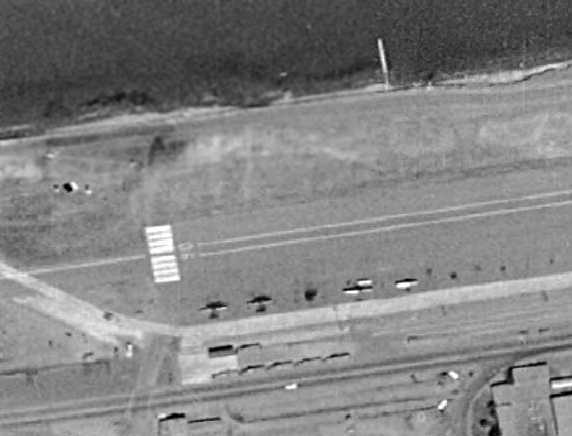 A 1993 USGS aerial view looking southeast showed Crissy Field's paved runway as well as a paved helipad on the northwest side of the runway. Recent views of the seaplane hangar & the landplane hangar. 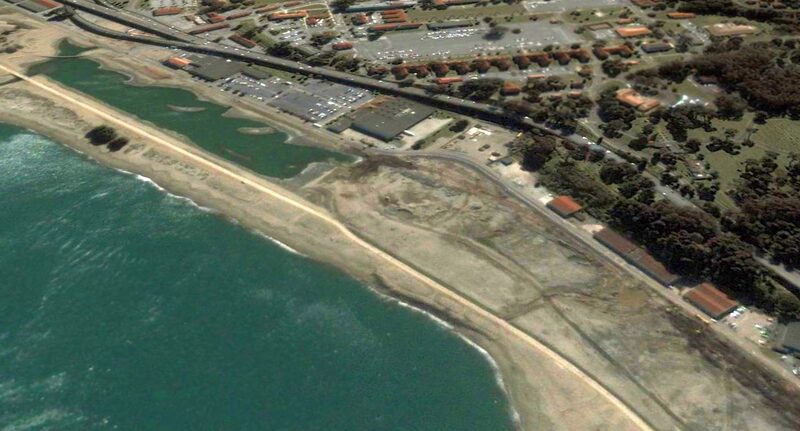 A bill was proposed in the Senate in 1996 to break up the runway of Crissy Field & restore the area to a wetland. Other plans were proposed to "restore the historic airfield". 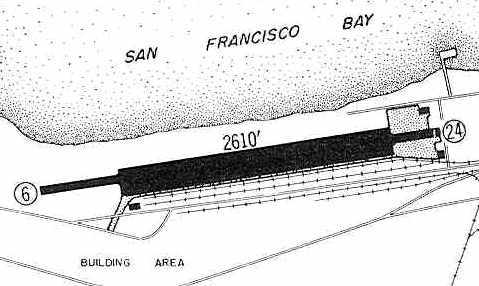 The 1998 USGS topo map still depicted the paved runway at Crissy Field. as that was the last time I landed there. as it is park of the Golden Gate National Recreation Area. We had to call in advance, and a park service fire engine would stand by there for us. Crissy would provide access to nearby specialized hospitals." and the eastern half of the former runway had been flooded, creating a 'tidal marsh'. It is ironic how the Park Service has deemed the "Historic Airfield"
to be a grass field which comprises only about half the area of the later paved-runway airfield. What makes the grass airfield which operated from the 1920s to the 1950s more "historic"
than the paved-runway airfield which operated from the 1950s to the 1990s??? Al Magary reported, “Some of the filming for the Eddie Murphy movie Dr. Dolittle 2 (2001) were in & around Crissy Field”. A 2003 photo by Tim Tyler looking across the former Crissy Field runway, at the fog enveloping the Golden Gate Bridge. A 2003 photo by Tim Tyler of one of 3 small aircraft munitions storage buildings, apparently constructed in the 1930s. A 2003 photo by Tim Tyler of "Building 933, the former Crissy Field Maintenance Shop with Dope & Boiler Houses." A 2003 photo by Tim Tyler of Stillwell Hall - once the barracks for soldiers assigned to Crissy Field, now empty. 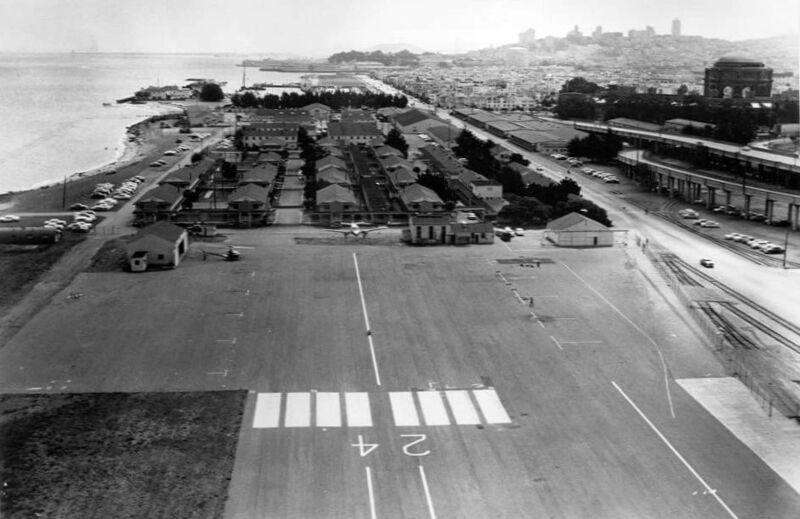 that Crissy Field used to talk with inbound/outbound aircraft, starting in the 1960s. 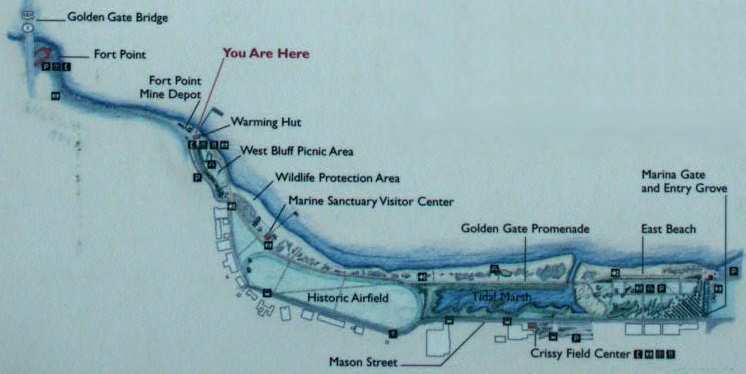 A 2003 photo by Tim Tyler of the Park Service map of Crissy Field. of what was considered to be the size of the field in it's 'historic' time period - up until the early 1930s. In later years, the length was expanded & it was paved. The 'wetlands' area covers the runway length added after the 1930s. due to them having excess dirt fill after creating the wetlands area. it's too small & not functioning as a true wetland could/would." with original buildings along the right side. 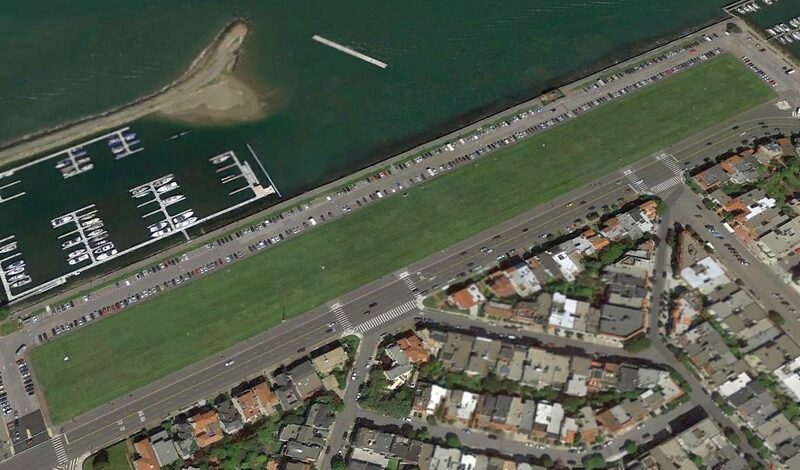 The original location of the paved runway on the east side of Crissy Field has been flooded (top of the picture). 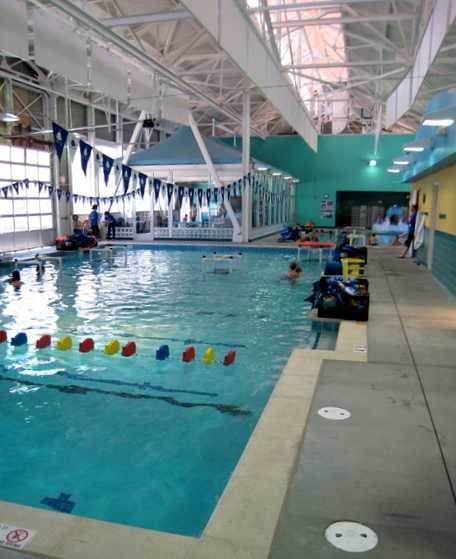 A June 2008 photo by Cris Baker of the interior of the former Crissy Field Maintenance Shop, now reused as an indoor pool. 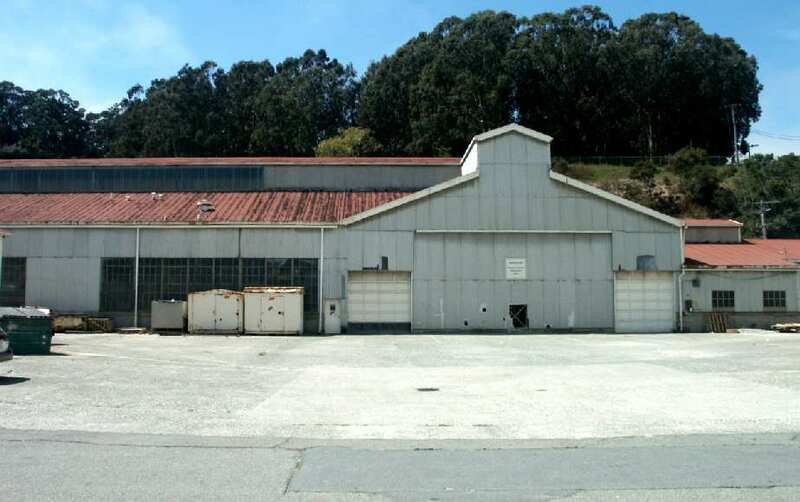 Chris reported in 2009, “My daughter attends swim classes in one of the old hangars (the former Crissy Field Maintenance Shop). A pretty nice & well-done reuse in my opinion. The original metal girder roofs are still in place, original windows & siding. Also nice [to see a] couple of air socks & an old billboard photo of female pilots / passengers on the side of the building. showing the location of the paved runway (bottom-left) has been flooded. A 4/13/15 aerial view by Dallam Oliver-Lee looking south at the west end of Crissy Field, showing the restored 1920s-era hangars. 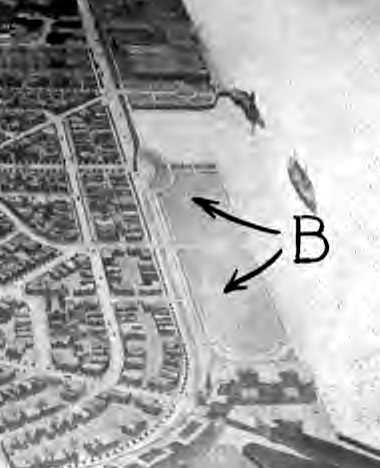 showing the “North Gardens” on the east side, which would eventually become Marina Airfield. was yet another airfield which had a role in early aviation history, Marina Airfield. (courtesy of www.lincolnbeachey.com, used with permission). and Silvio Pettirossi to furnish its visitors demonstrations of flying. 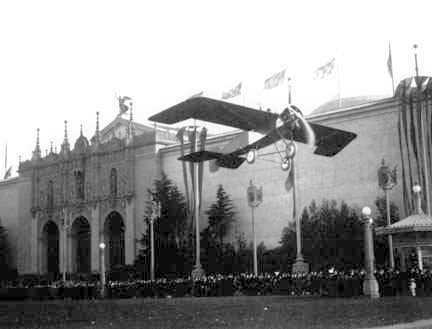 Aviation events took place at an open area known as the North Gardens, on the shoreline between Fillmore & Scott Streets. 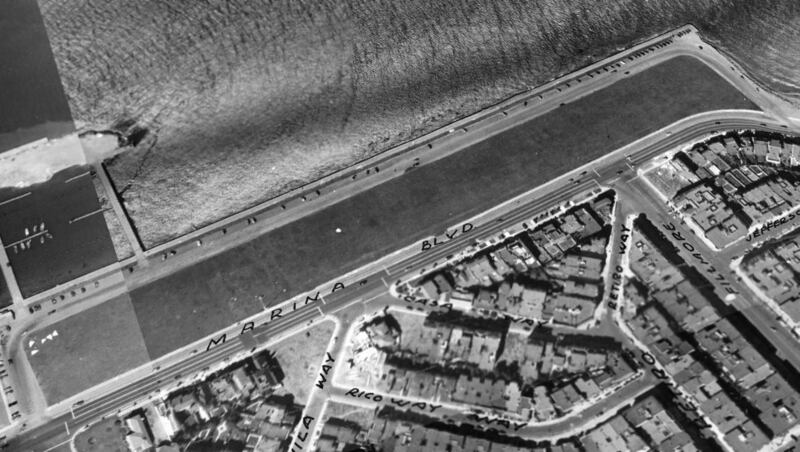 This area was later used by the city as an aviation field & Air Mail terminal, and was sometimes called Marina Field. who more than any other American exemplified the daredevil flyers of aviation's pioneer days. “Twice a day demonstrations of aeronautic skill were launched from the long sward of grass known as the North Gardens. would push their biplane out onto the east end of the gardens. turn his cap backwards, and tear off down the lawn. A colorized 1915 aerial view looking southeast at the western portion of the Marina Airfield (courtesy of Kevin Walsh). was on a 1919 Chamber of Commerce map (courtesy of Kevin Walsh), which depicted the “Marina Aviation Landing Field”. the first transcontinental postal airplane to leave San Francisco cleared from the Marina Field at 6:15 A.M. 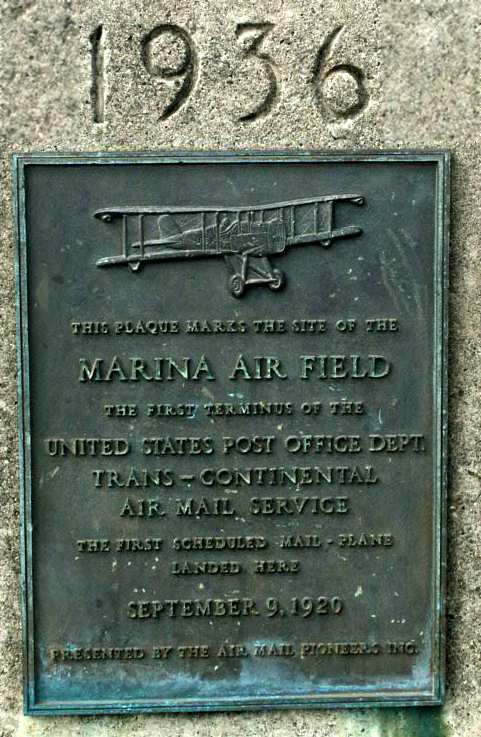 The February 1921 U. S. Air Mail Service Pilots’ Directions (according to Jonathan Westerling) described Marina Airfield as #187.
a monument 150 feet high, the Column of Progress, is on the north side of the field. A double line of wires borders the eastern edge of the field & this, in conjunction with the gas plant in the same vicinity, force the pilot to come in high. The pilot should hold the ship off until the runway is reached coming in either direction, as both the east & west edges of the field are very rough. A 5/16/21 Berkeley Daily Gazette article (according to Jonathan Westerling) details an airshow which was held at Marina Airfield. but also noted that increasing winds canceled some of the afternoon features. was an undated aerial view from the 1921 Eytinge's Flying Guide (courtesy of Alex Sheppard). The directory described the “Mongtomery (Marina) Field” as an “aerial mail field” with a hangar. “Marina Aviaton Landing Field”, as depicted on a 1921 map (courtesy of Kevin Walsh). described Marina Field as being a commercial airfield one half mile west of Mort Mason along the edge of the bay. It listed the airfield configuration as a 1,500' east/west by 500' north/south landing area with gas & oil available on the field. 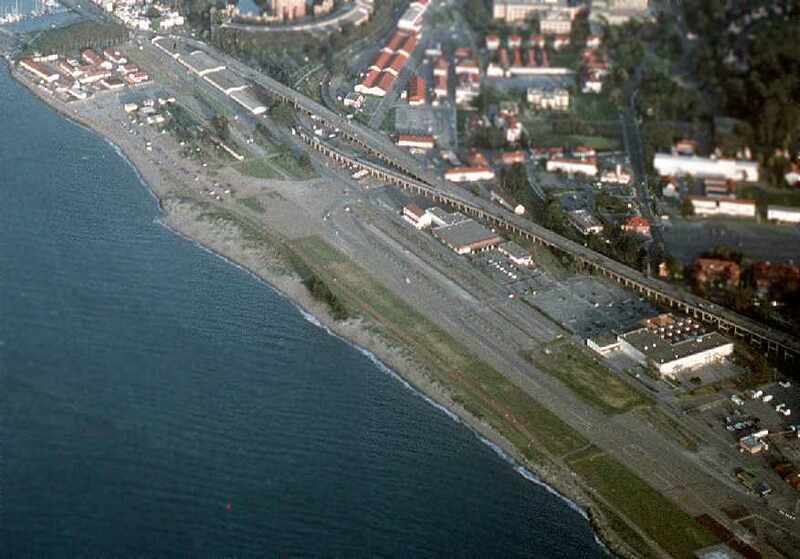 to replace Marina Airfield as terminus of the Air Mail route. In 1927 the City purchased land further south to establish Mills Field, the present day San Francisco International. A 5/27/29 aerial view looking southeast at the Marina Airfield (courtesy of Kevin Walsh). so its use had likely been discontinued by then. 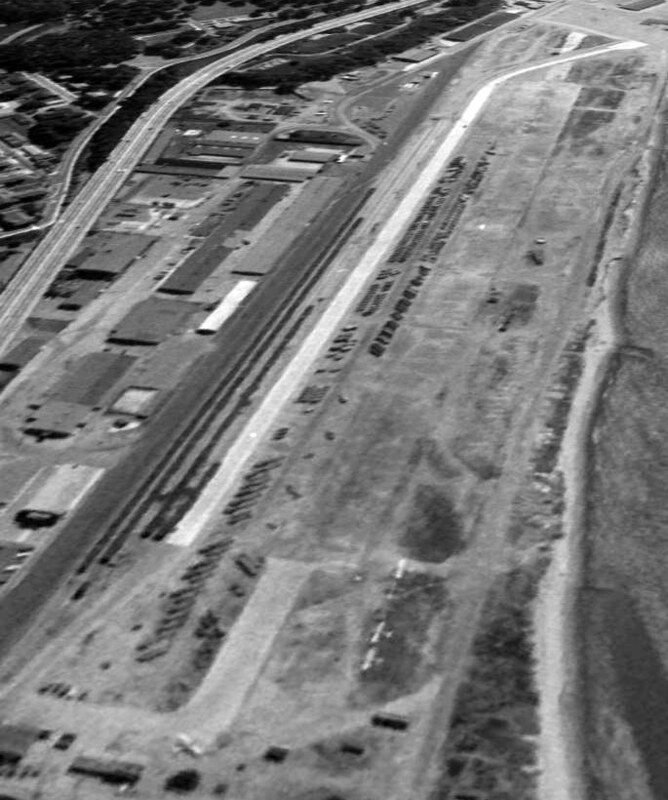 A 1948 aerial view looking northeast showed the Marina Airfield to have a single east/west grass runway, measuring 1,500' x 300'. at the intersection of Webster Street & Marina Boulevard (which is the eastern edge of Marina Airfield). According to a description of the flight, Hiller took off at the north end of Webster street & set the plane down on Marina Green. 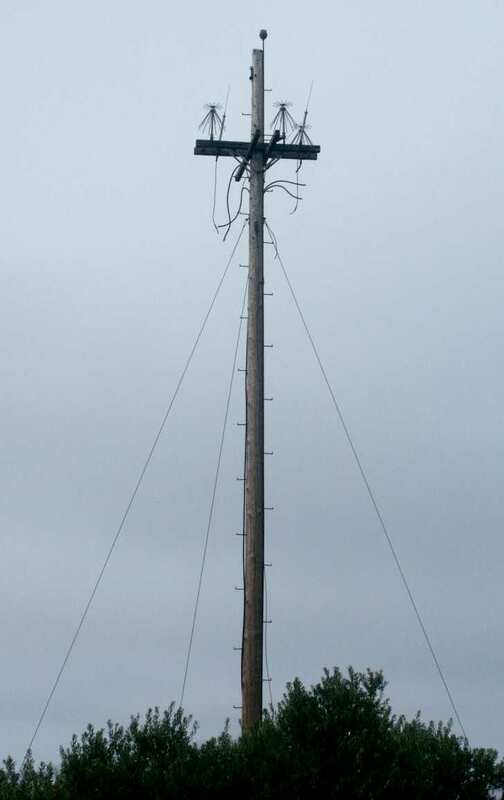 A circa 2000 photo by Bill Larkins of the pole with a historic plaque at the siite of Marina airfield. Airfield explorer Tim Tyler visited the site of Marina Airfield in 2003.
and was amazed to learn that Marina Green is a former civil airfield!" the first terminus of the United States Post Office Department Trans-Continental Air Mail Service. The first scheduled mail-plane landed here 9/9/20. Presented by the Air Mail Pioneers Inc."
"taken from the north side, approximately the middle of the field, looking southeast. and part of downtown San Francisco (including Coit Tower) in the center." to come fly kites, play catch, or just simply hang out. It's only about half a mile away from the old Chrissy Field area. probably dating back at least 60 years. and on the other side of that, San Francisco Bay. 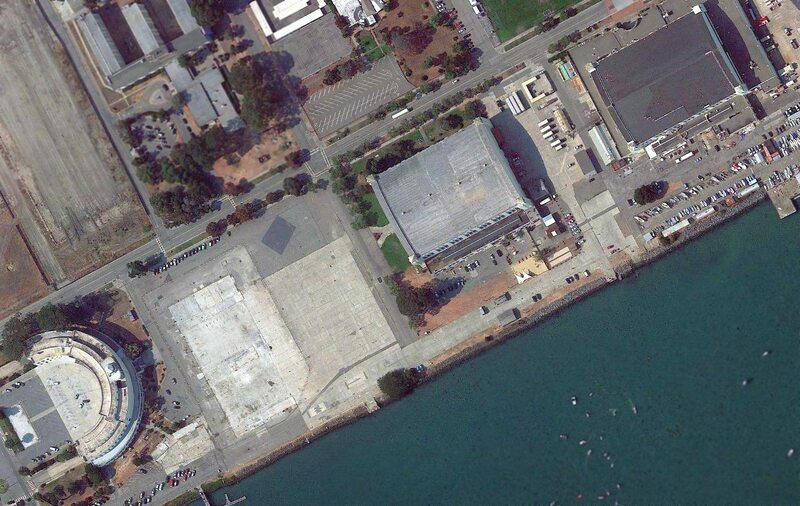 and the east side has a marina, and then the old Fort Mason." 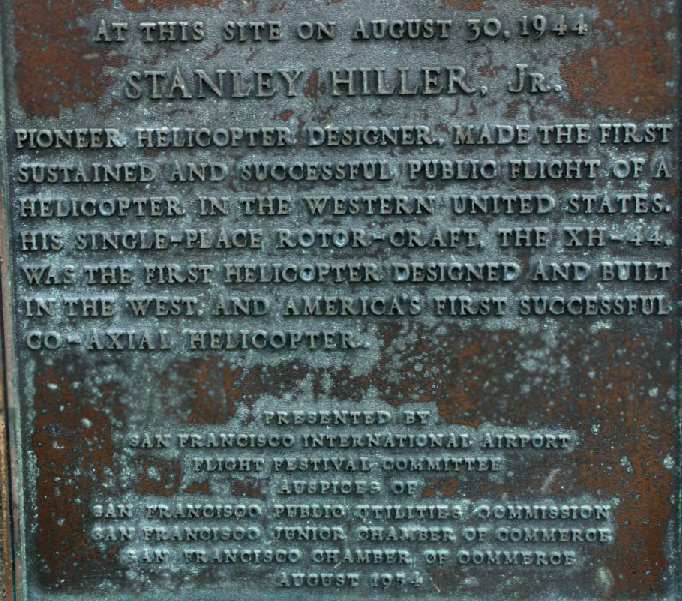 made the first sustained & successful public flight of a helicopter in the western United States. and America's first successful co-axial helicopter. Presented by San Francisco International Airport Flight Festival Committee, August 1954." 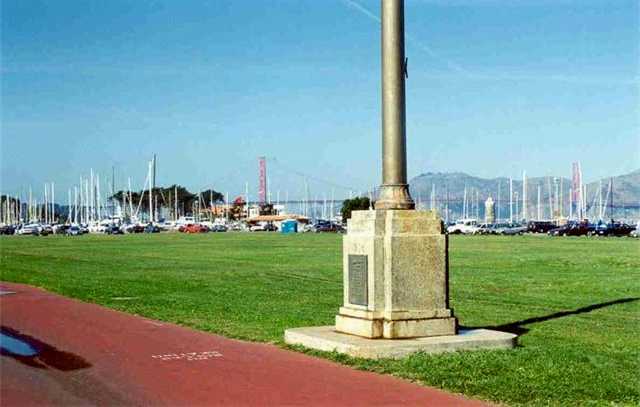 Tim also noted, "On the north side of the grassy area at Marina Green is another marker. It's about 15' tall, and reads, 'Memorial to William C. Ralston. It may be a clue that by 1941, the site was no longer any sort of airfield." A February 2005 aerial photo by Jonathan Westerling of the site of Marina airfield. 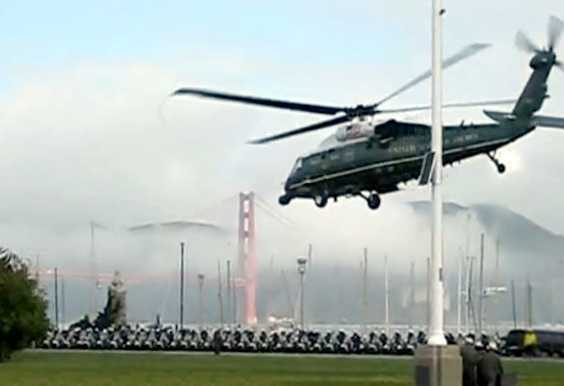 A May 2010 video capture (courtesy of Jonathan Westerling) of Marine One VH-60N taking off from Marina Green with President Obama. Note the fog-shrouded Golden Gate in the background, and the dozens of SFPD motorcycles. A 2016 aerial view looking northeast showed the Marina Airfield runway to remain intact after many decades. The site of the Marina Airfield is located northwest of the intersection of Mason Street & Lyon Street.